Navigating through this website is easier with the navigator frame which should be to the left of this window. If it is not there then click here to turn it on! Alternatively there is a system map at the foot of this page. More information about this website & why it was created can be found by visiting this website's "front" pages (link opens in a new window) . Many images are "clickable" - run the mouse over them and if a "hand" appears then click & a larger version will open in a new window! Although this page is primarily about the type of bus which was introduced in the 1950's, for the sake of historical accuracy it is worth pointing out that London's most numerous type of bus actually dates from 1939. Called the RT (Regent Three) 4825 of these buses were built for London, although they were not all in use at the same time. 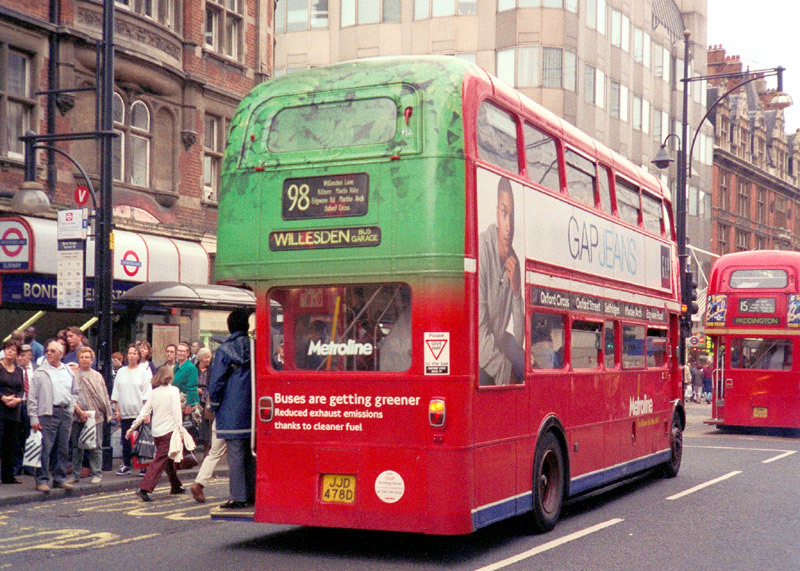 In addition, there were some RT variants, these being the longer RTL (1631 buses) and the wider RTW (500 buses) which all together gave London a heavily standardised fleet of similar vehicles that were used throughout the London Transport motorbus empire - Central area (red bus), Country area (green bus) and the express Green Line. Even so these did not represent the total fleet of London buses, other variants included the lowbridge RLH (ie: lower than standard height vehicles used on bus routes which passed below low bridges that were inaccessible to standard height double deckers), the single deck RF (Regent Four), the 1800 pure electric trolleybuses and more. Together these all dominated London's bus scene in a way which the Routemaster only perhaps did in the very central core of the city. 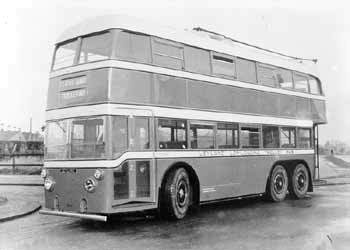 One of the reasons why London had so many RT buses was that after WW2 this bus design was chosen to replace London's trams. In those days only coal sourced air pollution was seen as a problem, few (if any) people understood (or cared about) the dangers of the pollutants in the waste gases emitted from diesel engine tailpipes. 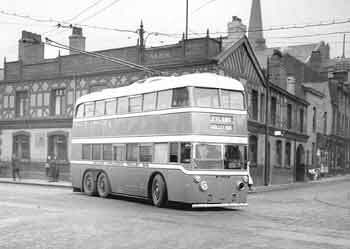 The first RT bus was introduced in 1939. This is RT1. The last RT buses left normal full time public service in 1979. RT3491 in Green Line livery in May 2012 operating a special service in connection with events commiserating the 1962 completion of replacing trolleybuses (which did not emit air pollution) with diesel Routemaster buses. Routemasters are different to most buses; they were designed to London Transport's own specifications specifically to be (relatively) easy to drive and cope with London's heavy stop-start traffic. First introduced in the 1950's they included many (for the day) revolutionary features, including a light alloy structure, independent front suspension, power steering, fully automatic gearbox and power-hydraulic braking. 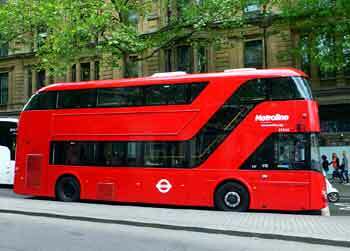 More recently they have become seen as a classic design of public transport, with a distinctive body shape that is globally recognised as an icon for "London" and a world away from the blandness of modern buses. At their peak there were approximately 2760 Routemasters in London, but since December 2005 only a handfull remain - on specialist part-time "heritage" routes aimed at tourists rather than Londoners. 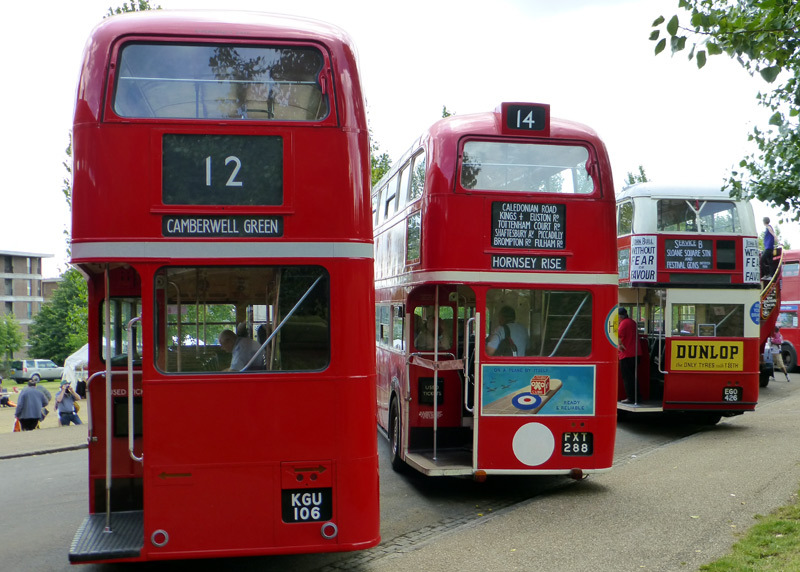 OK these were / are 'old' vehicles - the last Routemaster came off the production line in 1968 but as recently as March 2004 the surviving remnants (which numbered in the many hundreds) were still being re-engined / refurbished to give them at least another 10 years of useful life. Londoners realised that eventually they would be retired, but had been desperately hoping that their replacements would retain their passenger-enticing features, as well as introduce full accessibility for those members of the community who need it. Sadly the politicians who make the important decisions regarding London's transport had other ideas. 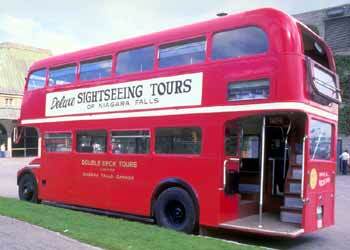 For the record, 50 front entrance designed Routemasters were also used by Northern General Transport of Gateshead. However with different windows, a different internal layout, a forward staircase and many other features, they were quite distinct from the London examples. The only other bus operator which bought Routemasters "from new" was British European Airways (BEA) whose fleet numbered 65 vehicles. These too featured a front entrance with a closing door and a non-London interior. 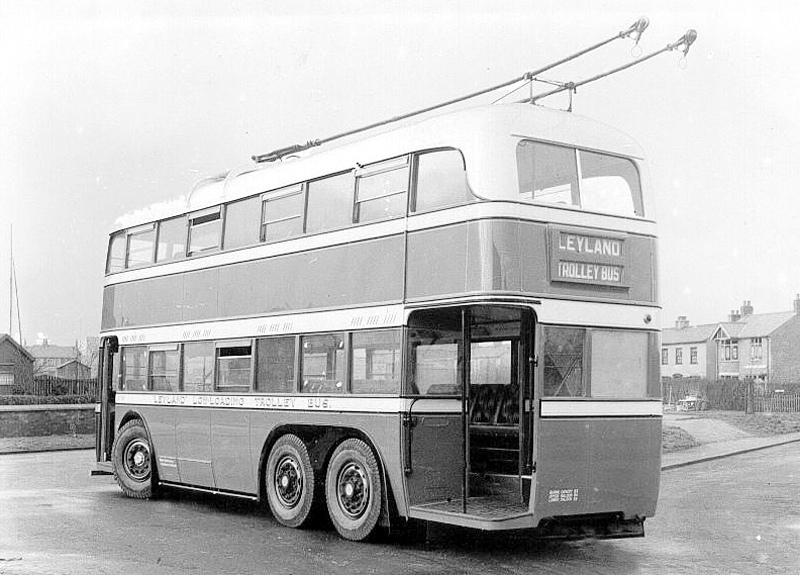 The BEA examples towed luggage trailers and were capable of 70 mph (approx 140km/h), which in those days was a permitted as well as safe speed for buses and coaches. Londoners prefered Routemaster buses because unlike pay-on-entry buses (the dreaded one person operated traffic jam on wheels buses with closing doors) the Routemasters have conductors to collect the fares and also offer a 'helping hand' for infirm passengers as they board / alight. Because of this, given a choice many senior citizens would vote for a Routemaster with conductor to assist them boarding / alighting in preference to a more modern driver only low-floor easy access bus. the senior citizens also appreciated the ability to reach handrails with both arms - newer buses have wider doorsways which may be ideal for wheelchairs but the opening is so wide that walking passengers cannot reach both handrails (left and right) simultaneously. Despite the higher cost of crew operation Londoners saw this as a welcoming feature which many would like to see reintroduced back to many other bus routes too. Londoners also liked the open rear platform which would let them board / alight the many times when the bus was caught in traffic congestion or at traffic signals. Other points in their favour included their fuel economy and relative quietness - thanks to their advanced lightweight Aluminum design Routemasters achieve 8 miles to the gallon whilst the much heavier and thirstier modern buses only achieve 5.5 miles to a gallon (surely this also means that the newer buses also create more air pollution?) plus according to tests by the UK Noise Association (as reported in the London Evening Standard newspaper) Routemasters were much quieter than their replacements. 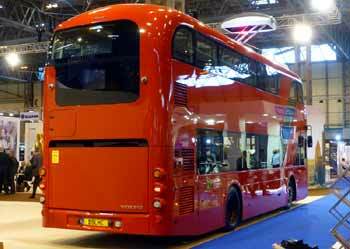 Apparently the average noise from the Routemasters' engine, tyres and exhaust was measured to be 89.6 decibels, whilst the new articulated buses deafen passers-by with 92.1 decibels, the new (not-articulated) single-deckers blast out 93.4 decibels and modern double-deckers emit an averaged figure of 90.6 decibels of sound. Of course these figures are average readings, but it is perhaps worth noting that the loudest bus detected was a modern double-decker which emitted an ear-shattering 104 decibels. (For the record it was also found that the noisiest vehicles on London's roads were large lorries which averaged 94.8 decibels. whilst the quietest were small lorries - such as three-tonne trucks - which at an average of 88 decibels were just below private cars). World Health Organisation guidelines say that any continuous noise above 55 decibels can be enough to cause "serious annoyance". The only things about the Routemasters which were "bad" were that there could be a problem (especially in some of London's rougher areas) with people attacking the conductors when asked to pay their fares (a social problem which also affected other types of bus, whether with conductors, driver-only pay on entry or open boarding); that sometimes there were accidents when passengers tried to board / alight from a moving bus and that the Routemasters were originally introduced as new high capacity motor buses to replace London's trolleybuses, which themselves were retired well before they became life-expired. Some Much Loved Features Applied To Other Bus Types As Well! Because the Routemasters were the last bus design to have open rear entrances with fares paid to a conductor and many passengers were too young (or too unknowing) to recall any other type of bus so there is an assumption that these features *only* applied to Routemaster buses. The images below should help to dispel this myth. Open rear entrances on RT buses (left and centre) and an STL (right) seen at the 2014 RM60 event commemorating it being 60 years since the launch of the first Routemaster bus. 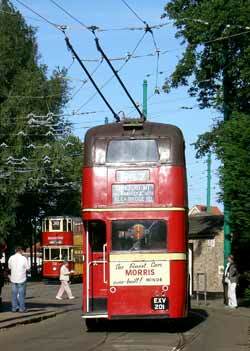 All 1,800 of London's former trolleybuses featured open rear entrances. 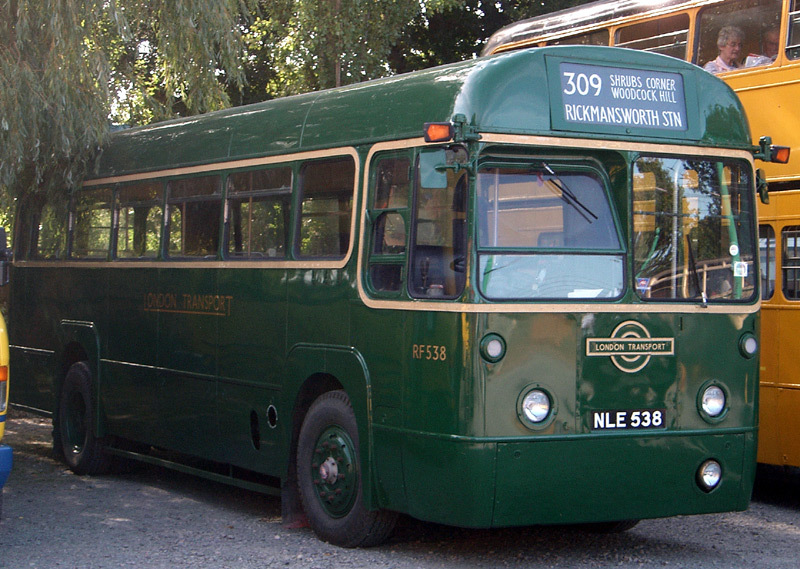 This example is seen at the East Anglia Transport Museum. 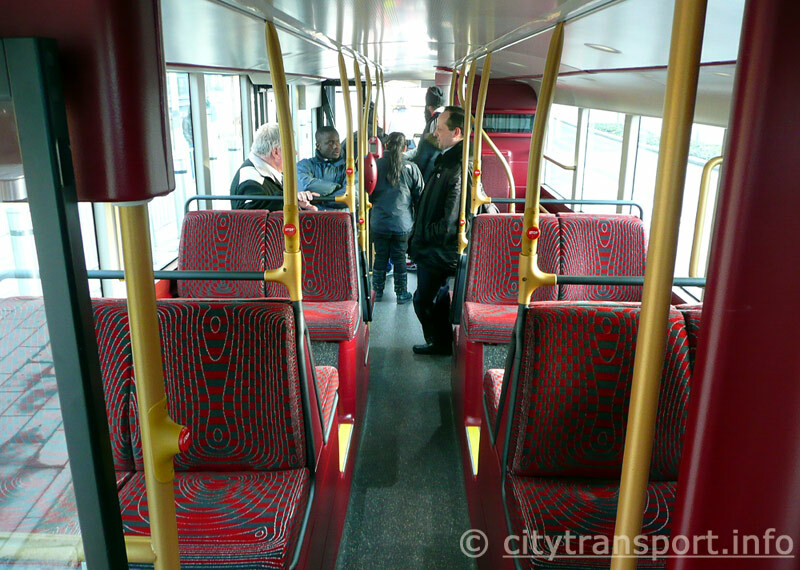 "only some ghastly sort of de-humanised moron would actually want to get rid of Routemasters." yet their scrapping was as part of transport policies which he personally oversaw. He had the power to change those policies. But instead he accelerated the process to "warp speed", thereby making sure that those policies could never be reversed. As an aside, in May 2008 he himself was thrown on to the political 'scrap heap' when he lost an election to a candidate whose manifesto included creating a Routemaster replacement. 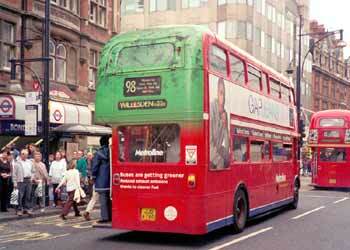 A refurbished Routemaster in London's Oxford Street advertising that now it has a cleaner engine it is 'greener' (sic). 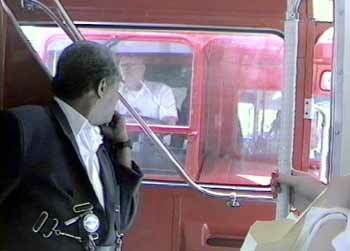 Routemasters are 'crew operated' - a conductor who collects the fares and a driver - who drives the bus. Note the large rear window - see text below for the significance of this. 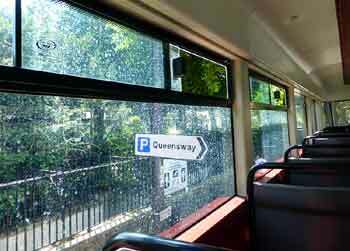 As the pictures (above) show, Routemasters have large rear windows. 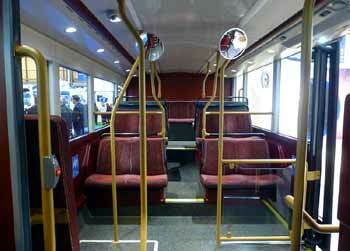 As a contrast many modern buses either have small or even no rear windows. 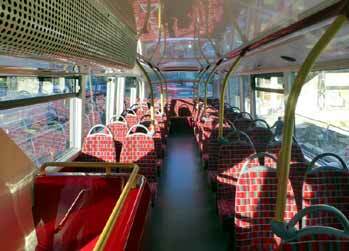 Apart from making the rear section of the lower deck very claustrophobic (which some people liken to a prison cell) the inability to see which other vehicles are following makes life very difficult for passengers whose journeys require a change of bus to complete. The reason for this is that where the two routes share the same road the ability to see whether the bus they want to change to is a long way behind / close by / nowhere to be seen etc helps the passenger choose the most advantageous 'spot' to make their interchange. Even if there is a purpose built passenger interchange it is still sometimes easier to change buses whilst in the street environment. Without the rear window the passenger may never know that the bus they want is right behind until it passes them (ie: too late!). Sometimes its the seemingly 'inconsequential' things like this that make a big difference to the passengers - many of whom would question whether the people who design buses ever actually use buses?? 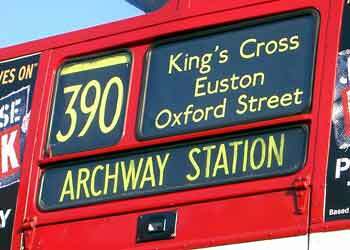 Another 'Routemaster' feature is the excellent quality of their destination signage - which means the route number & destination blinds. 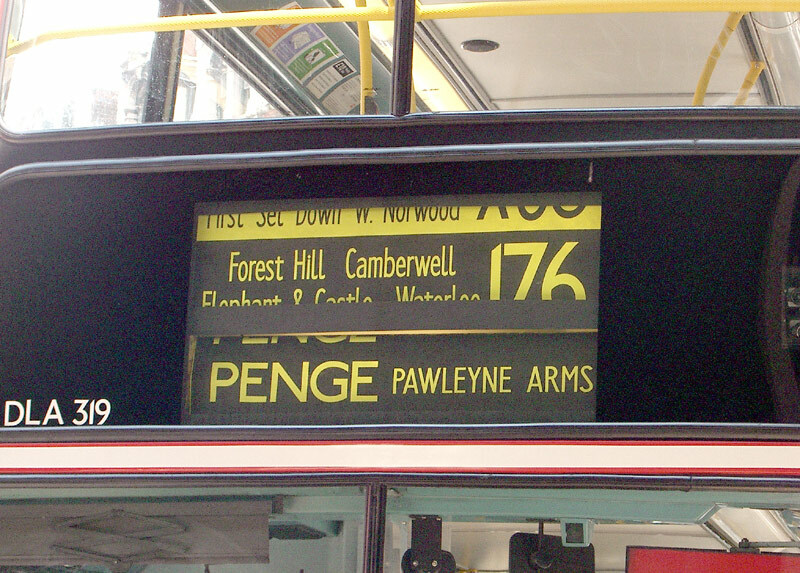 With Routemasters the route numbers and destinations are shown at both the front and back of the bus, with extra information above the doorway too. As a contrast would-be passengers trying to use many of the more modern bus designs will be lucky if the bus sports anything more than a route number and a destination - at its front, only! 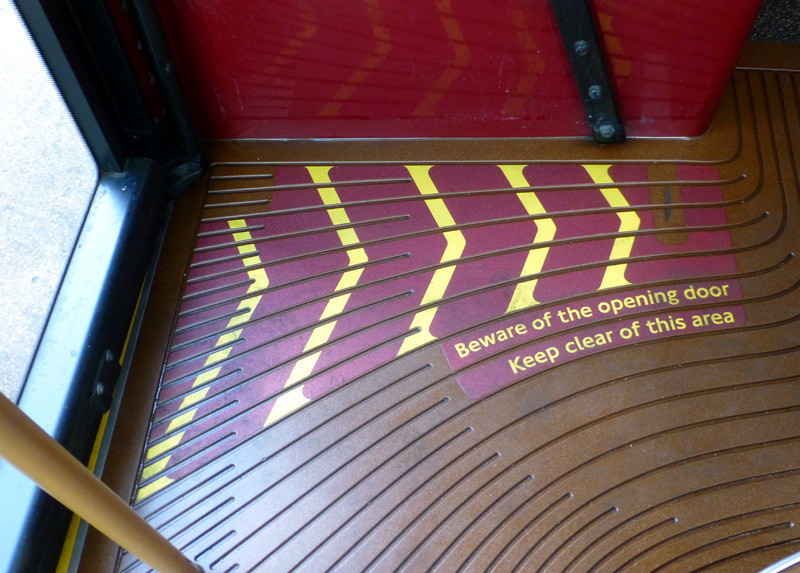 Routemaster destination signage (passenger information) at the front, back and above the entrance platform. The front view also includes the "bus lane camera" used to photograph vehicles which use bus lanes illegally. 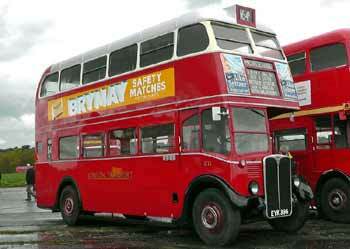 Motor buses normally have an expected lifespan of 15 - 18 years, yet many Routemasters lasted much longer than this. The following information (which comes from an internet-based discussion group about buses in London and includes bus drivers, garage staff & more) might help explain why. Well possibly why they had such longevity was the very fact they underwent time interval maintenance. 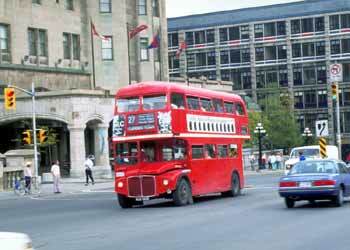 The amount of use those buses were put to in those days was tremendous. For instance: one bus on the 185 Victoria - Blackwall Tunnel was scheduled to start at something like 4.30 am and run all day and through the night and return to its garage at 5.30 am the next day. The regime being discussed doesn't even need computers! Back in the 1970s, working for the state owned National Bus Company, I well remember the (manual) system used by London Country Bus Services to monitor vehicle usage in order to schedule component inspection and replacement. In those days automating this process was investigated but it was concluded that it couldn't then be done any better or cheaper than local engineering staff were already doing it. re: the reference to LCBS (London Country Bus Services): at one time London Transport operated (red) Central Area buses in London and (green) Country Area buses in areas outside the main conurbation, however when in the late 1970's control of (red) Central area buses (plus the UndergrounD railway) became the responsibility of the (then) Greater London Council so the Country (green) bus operations became part of the state owned National Bus Company which operated many bus services elsewhere in Britain. 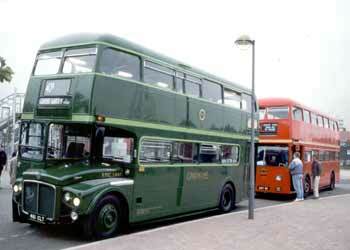 Routemaster buses which had been allocated to Country services remained with the hived-off business unit. Below is an example of how the time interval (preventative) maintenance system worked. 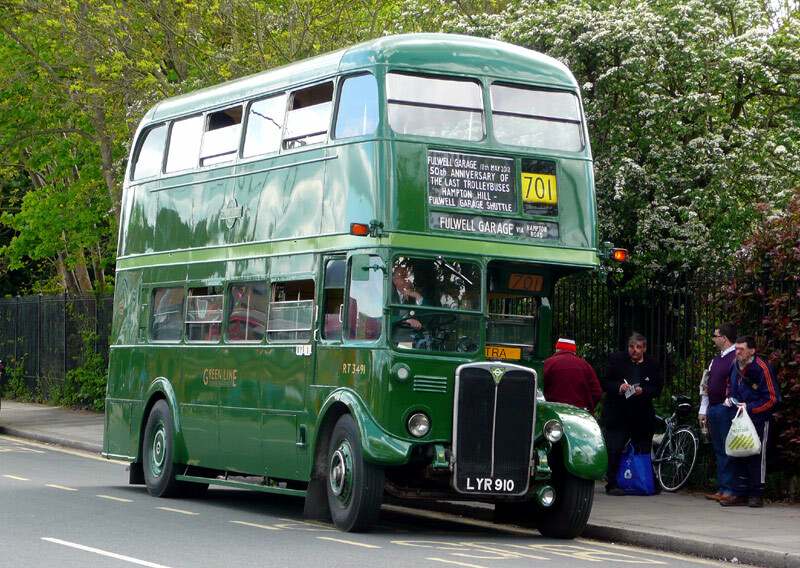 'RMC' is a coach version of a Routemaster bus which typically would be used on the 'Green Line' longer distance express services which often linked central and suburban London with nearby regional towns. Imagine an RMC taken off normal duties for one day, instead going out on AM peak jobs only. Back in the garage, by 10:00 the engine would have been removed, to be sent off (outsourcing by a Nationalised Industry in the 70s!) for overhaul. By about 15:00, the replacement engine previously refurbished would have been installed and tested; the bus would then be made available for PM peak duties. The discussion continued to discuss the merits of time interval (preventative) maintenance and that as it costs money whether a private company would see this as an optional expense. It was suggested that the 'present day' philosophy is most likely to be to see it as a "useless" expense and to question the point of it, with instead the policy seeming to be "wait till it breaks down, we can't spend the annual bonuses on trivia!". One person suggested that maybe the leasing companies which actually own the buses should include preventative maintenance into the leasing contracts - that is assuming most buses are leased, rather than bought outright. However someone else pointed out that this is not so easy with modern rear-engined buses and mentioned trials by London Transport engineers with a type of bus known as a DMS at their (now closed) Aldenham main bus works which found that removing the engine can take days rather than hours. The benefits of time-interval servicing was recently briefly mentioned on another group, where reference was made to the fact that the Northern General Routemasters (ie: a different bus operator remote from London) only lasted around 17 years in service - they did not have the same maintenance regime as London. 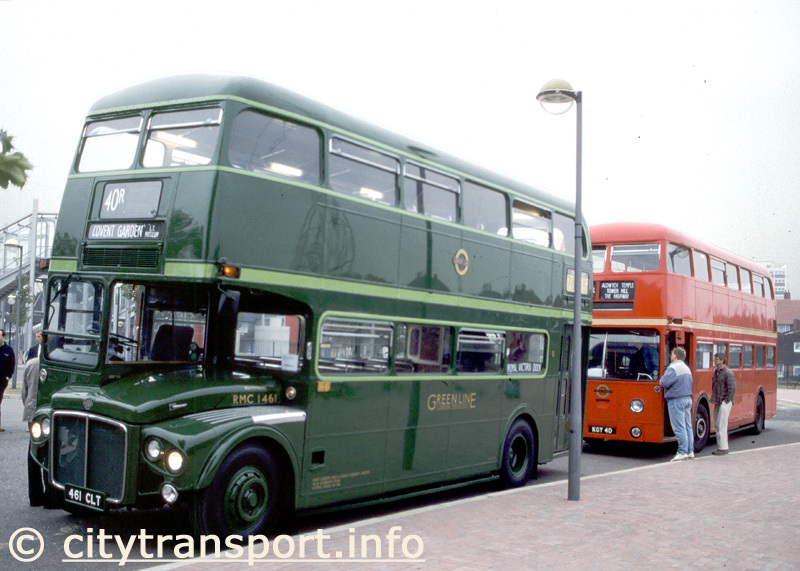 The two images below show withdrawn former London Transport buses which have been preserved in some of the different guises under which they operated - including the familiar red livery as well as the green liveries used by the Green Line coaches and country area buses. Preserved ex-Green Line RMC 1461 (Routemaster Coach) with a powered rear entrance doorway and the unique (for London Transport) experimental front entrance / rear engine FRM (front entrance Routemaster) being used to take visitors from a railway station to the site of a special event. A preserved ex-London Transport bus (actually of an older design known as RF - not all of London's buses were double deckers!) 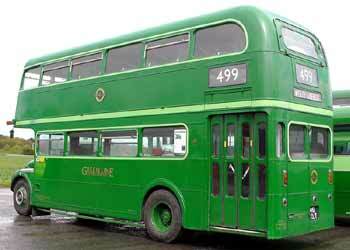 in the green livery as used by Country area buses. Note that the vehicle still features the standard LONDON TRANSPORT fleetname on its side. Such was the dismay about the demise of the Routemaster that several websites were created to try and 'save' them. Both of the campaigning sites detailed below included petitions which could be signed. However neither is still extant and the links have been deactivated. 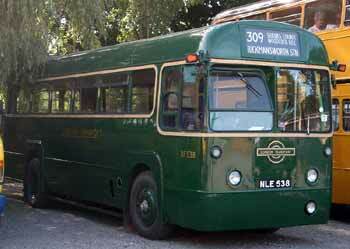 The still working link is for a specialist (not campaigning) website for Routemaster owners. Routemaster (RM) Association membership is open to anyone with an interest in RM's - enthusiasts, operators, private owners and suppliers of parts or services. Anyone who has a genuine interest in the preservation of these vehicles is most welcome to join. 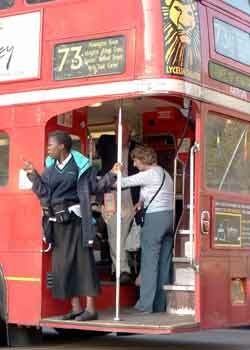 Descending from a Routemaster on route 73 which is stuck in traffic at the Marble Arch end of London's Oxford Street. In the distance on the left can (just) be seen the Marks & Spencer store, beyond that is Baker Street and the Selfridges department store. 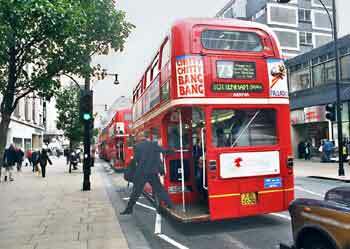 16 Routemaster buses were retained to operate on two central London "heritage" bus services which operate during the daytime only. Running under the route numbers of 9h and 15h these heritage services were actually short workings of existing bus routes 9 and 15. 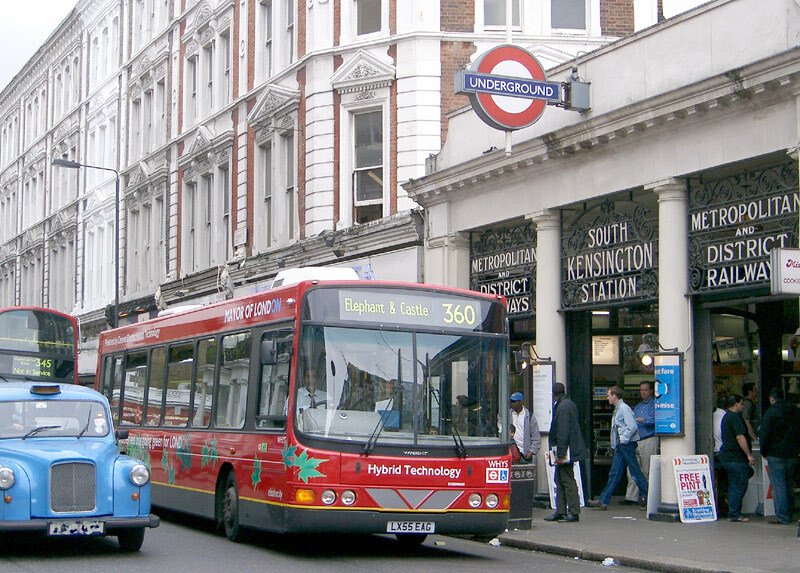 It has been suggested that the choice of using existing routes was made because in this way the buses are not on "new" services, which would have seen them need to meet various requirements for "special needs" access, which of course is just about the only aspect of the Routemasters where they are unsuitable. NB: Since this photograph was taken route 9h has been withdrawn, however original Routemaster buses still run on the 15h, albeit less frequently than originally. They Were Preferred Outside Of London Too! It is not only in London that the Routemaster has proven popular. During the early years of bus de-regulation many bus operators across Britain bought 'surplus' (sic) examples from London Transport as 'enticements' to attract more bus passengers away from their commercial rival's. One such town was the Essex seaside resort of Southend-On-Sea; here they found that not only did patronage increase but that passengers would 'vote with their feet' and let the dreaded buses with doors pass, even if it was raining! Much to the local bus company's delight they even got favourable coverage in the local newspapers and TV news. Everyone agreed that Routemasters were what the local people wanted. 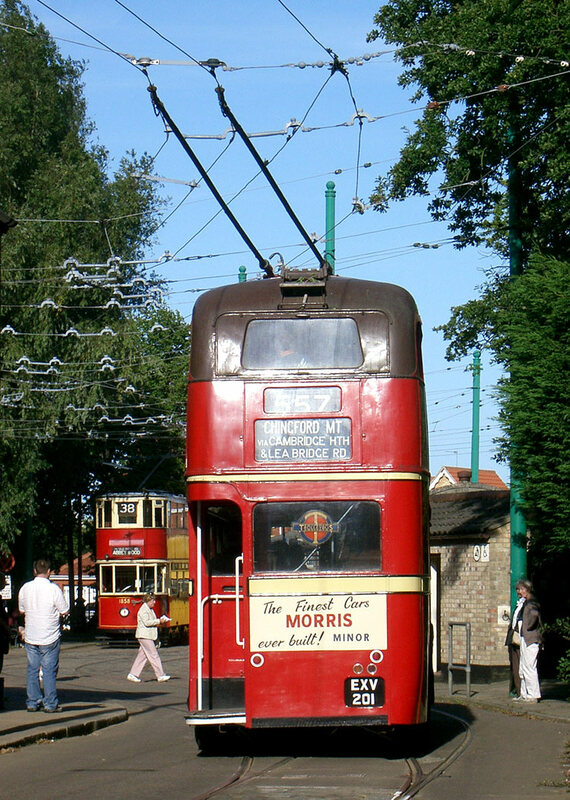 Routemasters in Southend - On - Sea, where the found that by bringing back conductors and banishing the pay-on-entry queues passengers made a pro-active choice to use these buses. 1994 saw celebrations for the 40 years since the first Routemaster was built (in 1954). 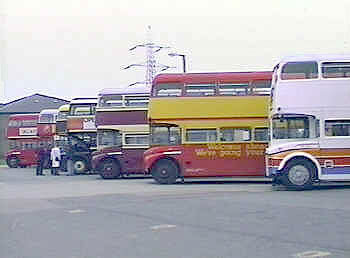 This view shows a line-up of these buses in some of the many liveries from the many cities they now run in. Another unexpected benefit came in the very severe winter of 1990/1, when there were extreme frosts combined with very heavy snow. Whereas Southend Transport's modern one person operated buses with doors kept breaking down (too cold, their systems just froze up) all the Routemasters ran faultlessly. 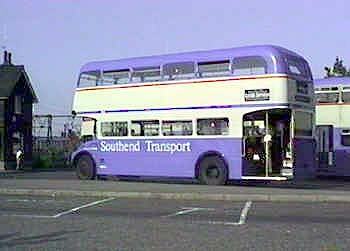 Many suggest that if the council-owned bus company had not been sold off (ie: 'privatised') then Southend would still be using these buses today. Their withdrawal from our towns and cities was partly because the big bus owning cartels are primarily interested in the economics of their operations, and to them crew operation was deemed 'uneconomical' (even though it attracted more passengers) plus partly because of their advanced age and partly because of their polluting engines; these all made using Routemasters to be seen as not "politically correct"; nevertheless the fact that they were preferred and attracted people to bus transport should not have been deemed "irrelevant" (sic). It is very regrettable that now bus services in Britain are mainly owned and operated by a fistful of large cartels such customer-focussed marketing ploys have been discontinued. They Are Even Popular Overseas! 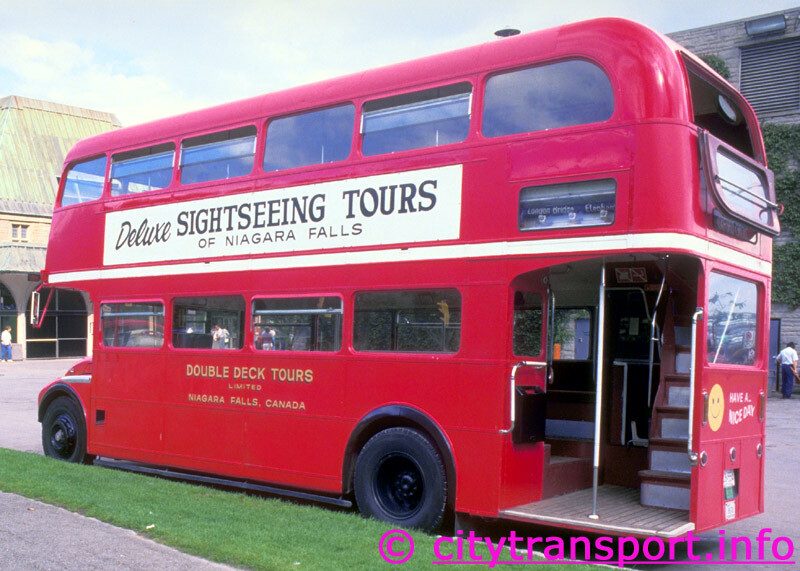 Over the years many retired British double decker buses (especially London Transport Routemasters) have been sold abroad to operate tourist services. Perhaps its the novelty factor of travelling upstairs, or the 'Ye Olde England' ambiance, who knows? but tourists seem to love them. Indeed even if when at home they would never normally use buses it seems that when taken out of their daily routine people will behave differently. Even if Londons' transport authorities do not want them, it seems that there are others who do! These examples were spotted in Ottawa, the Canadian capital (above left) and on the Canadian side at Niagra Falls (above right). Time For "Routemaster - The Next Generation?" 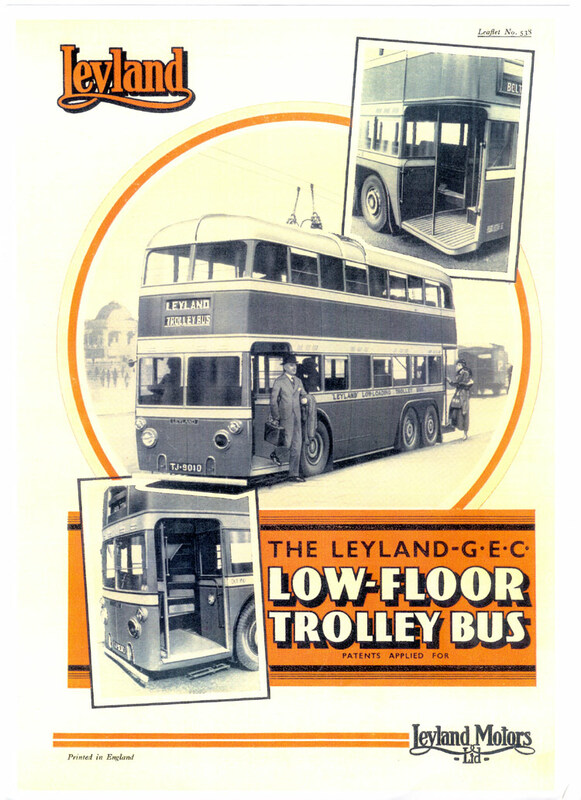 Manufacturer's promotional leaflet and photographs for the twin staircase 69 seater 1935 Leyland 'TTL' low - floor double-decker that could form the basis for an accessible (and acceptable) replacement for the Routemaster. Being a trolleybus it would also help to ameliorate problems with urban air pollution. 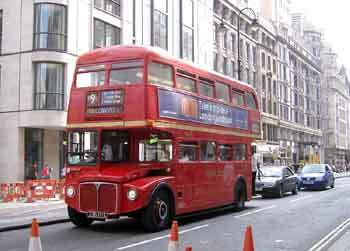 Concurrent with the demise of the Routemaster was the fleetwide introduction of the single deck articulated bendi-bus. These buses were not used as direct replacements for Routemasters - some also replaced the pay-on-entry double-deck buses too. 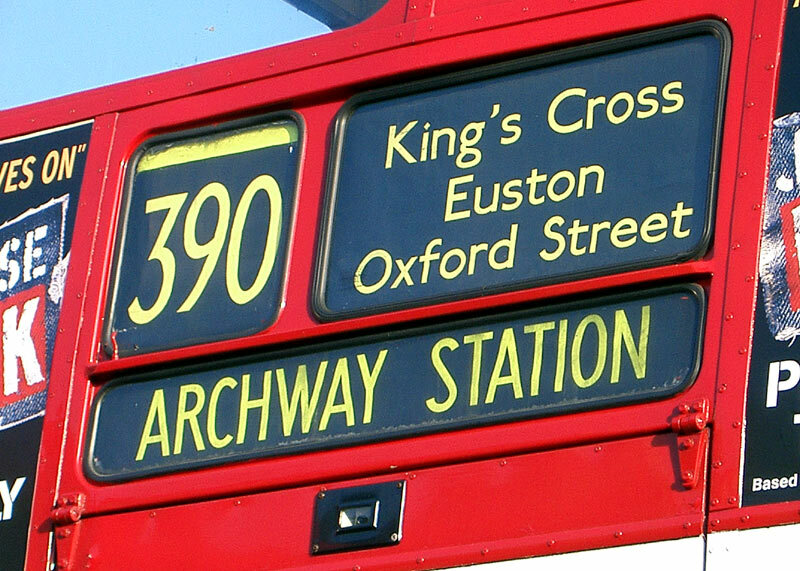 The conversion of a bus route to articulated buses also saw the adoption of the "off-vehicle" ticketing system throughout that bus route ("off-vehicle" ticketing already applied in central London but for articulated bus routes it was extended out into the suburbs too) and a reduction in service frequency because with their increased total passenger capacity two articulated buses typically replaced three double deck buses. 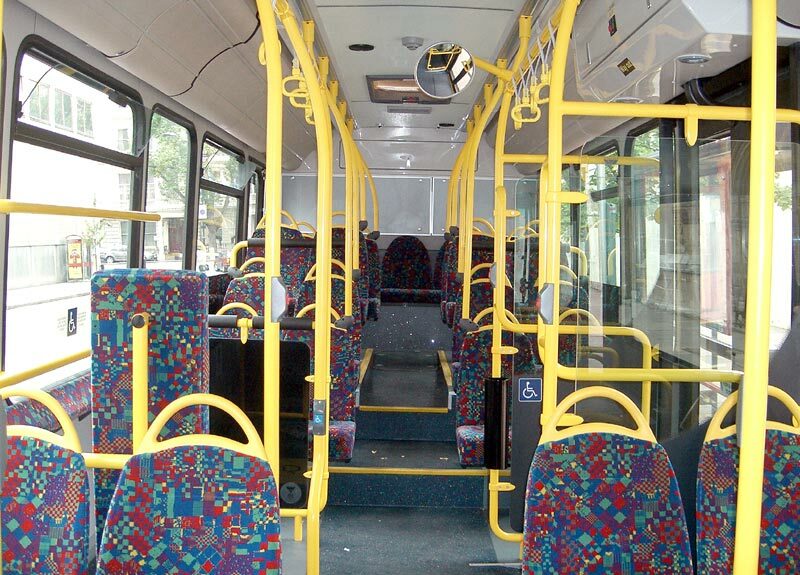 Articulated buses are excellent for their general accessibility (special needs & everyone else) and because the three sets of wide doorways allow passengers to alight and board in very short time frames, thereby reducing stop dwell times and speeding the service. However their introduction in London was less than popular with many able-bodied passengers who bemoaned the frequency reductions (which meant they had to wait longer at bus stops - something that no-one likes doing) and that articulated buses achieve their greater total passenger capacity at the price of there being considerably fewer seats. 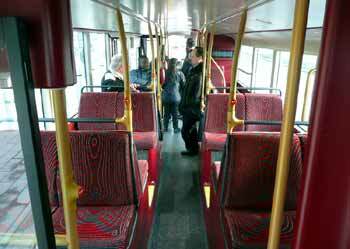 Most able bodied passengers dislike(d) being forced to stand in this way - they would prefer to sit down. The loss of the grandstand views of the passing London scenery as seen out of the double deck buses' top deck windows also irked some passengers. For reasons which cannot be looked at too closely here the articulated buses became known (in some areas) as "happy" buses or "free" buses, with a significant proportion of passengers not paying their bus fares and for reasons of personal safety roving ticket inspectors were said to be refusing to work on these buses except as part of large groups, preferably also with significant police assistance. London, as with most other large cities, has some areas where for reasons of personal safety even the police prefer not to go out on their own. 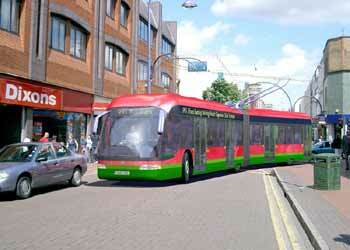 At the end of June 2004 articulated buses were introduced on a bus route which serves my local town centre. Because of the illegally parked car in the view on the left (on double yellow lines!) the bus has difficulty turning the corner and its rear axle just about misses clipping the kerb on the inside of the bend. The articulated buses only lasted until June 2011, when they were reconverted back to double deck buses. Articulated buses did not find favour with some Londoners who claimed that they were too large for some of London's narrower streets, unsuited to some of London's street layouts (ie: either a nuisance to other traffic or just unable to make turns at space-limited road junctions), often blocked road junctions when delayed in traffic and generally created danger for cyclists and pedestrians. Whilst the road layout concerns may not have been totally without foundation the reality is that such buses are used very successfully in many other conurbations planetwide. Trams are often even longer than the articulated buses yet few people comment on their length. In 2008 an election candidate for London's Mayor included in his manifesto the removal of all articulated buses from London's streets and the introduction of a new Routemaster bus (as described below). Both election pledges look likely to be fulfilled by the end of December 2011. 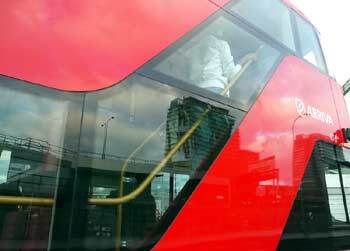 The articulated buses are mostly being replaced with standard double deck buses. In the late 1990's Transport for London (TfL - the London-wide regional government body for transport) published plans for a 33 mile (53km) high-profile Bus Rapid Transit (BRT) system for east London & metropolitan Essex using clean zero emission electric trolleybuses. Known as East London Transit (ELT) this is part of a series of locally based transport schemes within the Greater London area which (at the time) planned to see trams used in south, west and central London as well as another trolleybus-based scheme for south-east London - this latter system eventually using its own dedicated lanes on a new bridge spanning the River Thames and then physically interconnecting with ELT. 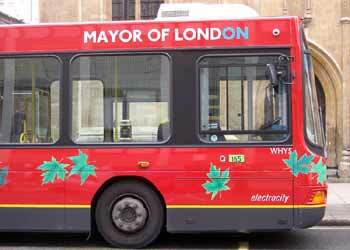 Although the modal choice was influenced by the fact that a steel-wheel tramway would not have been financially viable TfL's own figures showed that the electric buses would have provided the most financially beneficial option and generate 24% higher revenues than a diesel bus scheme ("East London Transit - Summary Report" published by TfL in July 2001). However by March 2005 TfL had back-peddled on their plans for ELT to use trolleybuses - and instead of lobbying against this downgrading the local councils in the relevant areas all blindly rubber stamped these changed proposals as if they are TfL's pet poodles. (This includes the London Borough of Redbridge, which is my local council). When TfL asked for local people's opinions the response was 2:1 in favour of trolleybuses AND against yet more polluting dirty diesel buses so changing these proposals in this way makes a mockery of any form of public consultation - and even the democratic process which underpins our nation - as well as giving the impression that TfL see the people of east London as second class citizens who can be fobbed off with dirty diesel buses whilst they planned to give the people of south, central & west London are given clean zero pollution (in the streets) electric tramways.So far only South London / Croydon has actually received its trams. Whilst it is true that the existing congestion charge zone has resulted in lower levels of air pollution within central London this only benefits the relatively few who live and work there - the introduction of trolleybuses throughout London would benefit considerably more people throughout the entire Greater London area "adding value" to their (our) daily lives without either falling for the fashionable idea that its good to extract money out of motorists' wallets or negatively impacting on economic activity (although the oil companies might see sales fall). If still felt to be desirable the expansion of the charging zone could always be realised at a later date. It can be alleged (but not proven) that there might also have been an element of "questionable integrity" with respect to systems installation costs. Pages 27 and 35 (plus others) of the East London Transit - Summary Report as issued by TfL in July 2001 make it quite clear that the cost of the trolleybus option included an under-road electronic guidance system (ie: the buses would be self steering). 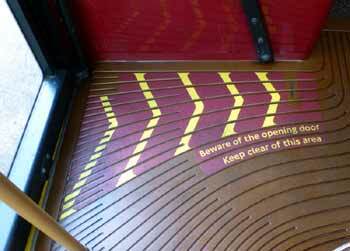 But trolleybuses do not need such guidance (the bus driver can do that!) and it could be said that the inclusion of this has only acted to deflect the installation costs upwards. This leads to the question "were the reasons for specifying the unnecessary guidance system to sabotage the trolleybus option by making it appear more expensive than it need be?" This image is a composite showing the same location as above left but after a professional CAD (computer aided design) draughtsman from the Electric Tbus Group - www.tbus.org.uk made it much more environmentally friendly by replacing the diesel bus with a trolleybus, as might have appeared on the ELT scheme's route No.991. Trolleybuses, electric buses, air pollution and why so called "cleaner" diesel (aka "less dirty") buses could be worse that buses which give off visible smoke are looked at on another page. Poor health caused by air pollution is a big problem in London and with as many as 7000 diesel buses on London's streets it stands to reason that they must be part of the problem - with zero-emission (at point of use) electrically powered trolleybuses being part of the solution. In 1999 more Londoners died of air pollution related illnesses than in road traffic accidents. In February 2005 the Chartered Society of Physiotherapy - CSP - published a report warning that the PM10 air particles which are emitted mainly by diesel engines pose such a serious threat to public health that the World Health Organisation (WHO) believes there is NO SAFE exposure limit. The CSP's analysis revealed very high levels of this dangerous pollutant - not just in London but throughout the UK. The full story can be found by following this link. In an effort to combat air pollution London's Mayor has declared that from early 2008 the entire Greater London area will be a "LEZ" Low Emissions Zone, Of course this is very laudable and there is no question that as a result there will be a reduction in the not inconsiderable air pollution emitted by taxis and heavy goods vehicles. But because buses enjoy the unique advantage in that they follow pre-determined fixed routes so their electrification using overhead wires would be relatively straightforward. For administrative convenience the LEZ will mostly be considered to be the area within the M25 Orbital motorway, although the motorway and London's political boundaries do not exactly coincide. The LEZ is being rolled out over a number of months with different types of vehicles needing to comply at different stages of the roll-out. 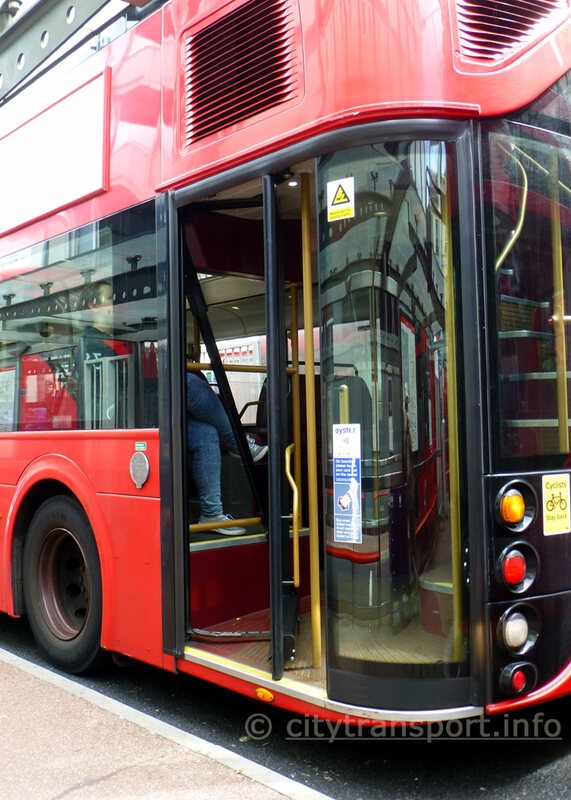 The Electric Tbus Group has conducted a detailed study which suggests that for London the conversion of the busiest bus routes (eg: those with a frequency of every 5 minutes or more) would offer significant financial and environmental benefits. Thanks to the network effect where multiple routes operate along the same roads the situation would soon arise whereby many subsequent conversions would entail less additional wiring - both increasing the cost effectiveness of existing wiring and reducing the cost of the electrification of additional routes. Plus of course Londoners would benefit from the significantly cleaner air in the streets where they live, work and play. Diesel Hybrid Technology - Is This Just "Cloak & Mirrors"? In the search to find a bus solution to air pollution London's transport planners seem to be enthusiastic to try every which option possible, except those which are already proven viable. This includes what are known as "hybrid" buses. 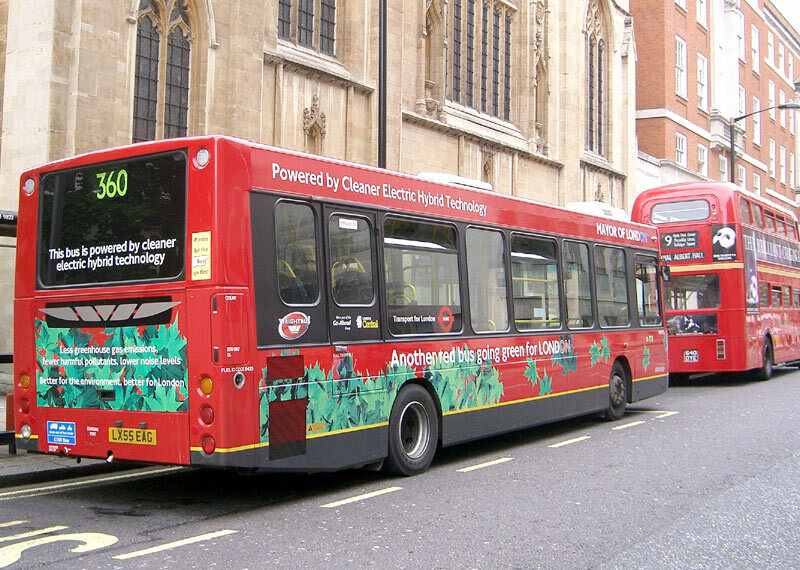 Hybrid buses come in various guises, the variants being trialed in London feature a diesel fossil fuel engine that runs at a constant speed to charge batteries which power the buses' electric drive system. Normal motor buses create the most noticeable pollution, noise and sometimes even visible smoke when they are starting from rest - ie: pulling away from a bus stop, red traffic signals, etc., so by running the fossil fuel engine at a steady speed it is possible to sidestep this. However it must be remembered that whilst these buses produce less air pollution they do still pollute their local environments, and therefore are simply incapable of being substitutes for quiet zero emission electric trolleybuses. One unknown factor with hybrid buses relates to their batteries, which will (eventually) require replacing. As yet it is too soon to know exactly how long (how many years) before this becomes necessary - and how much it will cost. Early indications point towards the very high cost of battery replacement (especially on a large fleet of such buses) possibly being their Achilles heel. Dealing with the large number of waste batteries will also require some environmentally enlightened decisions. The travelling experience on these buses is different to regular diesel buses in that the usual engine noise (which varies according to speed) is replaced by a flat droning background engine noise, which a bus driver described as being akin to that of the aircraft engine noise heard by passengers whilst flying. Depending on where a passenger is standing or sitting it is sometimes possible to feel vibration from the engine too. Noise apart the electric drive system makes hybrid buses smoother to ride in than regular motor buses, plus there is considerably less "rattle" when stationery. 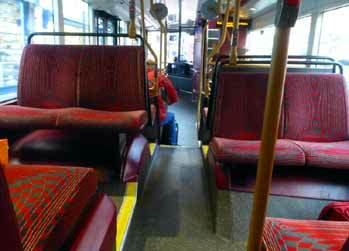 If sitting at the very back of the bus there is a slight diesel smell and the warmth of the engine can also be felt. Click the speaker symbol or here to download a 426kb mono soundclip (named inside-hybrid-bus.mp3) which was recorded using a mobile telephone and demonstrates the engine noise as heard whilst sitting at the back of the bus. More information about hybrid buses can be found on a dedicated Hybrid Buses page. Bus No. 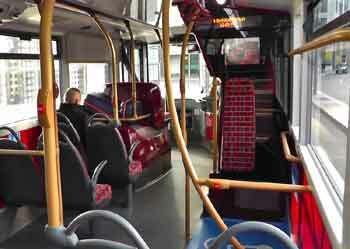 WHY5 which is number five of the six diesel - electric hybrid buses being trialed on route No. 360 in London, summer 2006. The view above left shows the vehicle that had been travelled on trying to pull away from a bus stop outside South Kensington underground station. The vehicle's destination (Elephant & Castle) is a part of London where people with cameras need to be very very careful. The other views were taken at the Kensington Gate terminus which is also used by the Heritage Routemaster buses on route No. 9h. 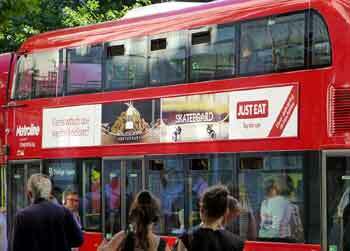 As the logo above the front of the bus in the view above right suggests, these trials are being carried out with the approval of London's Mayor. The vehicle designation code ("WHY") makes for a (probably unintended) alternative meaning. Notice the lack of rear view window, which is necessary in order to fit in all the mechanical components without intruding too much into the passenger saloon. Passengers who need to change from this to another bus to complete a longer journey will not appreciate the inability to see if the next bus they wish to travel on is close behind. The slogans on the back & side of the bus which talk about it being powered by cleaner electric hybrid technology would be equally truthful if they proclaimed less dirty diesel hybrid technology. Just as the Routemaster buses seen above were popular outside of London too so the benefits of the electric trolleybus would also be appreciated elsewhere in Britain. The logic however is more than just emotional. Electric buses would help alleviate the problems of local air pollution - not just in the street domain but also within the wider global context. This would then help us in Britain meet our commitment to cutting carbon dioxide emissions by 20% by 2010. The House of Commons environmental audit committee says that carbon emissions from transport are 'still moving in the wrong direction' but apart from clobbering motorists with yet more taxes the govt. has failed to find effective ways to entice people out of their cars. By attracting car users who would not switch to a modern motor bus electrification of our urban bus routes could help reverse this upward trend. This would also help reduce overall road traffic levels too. A nationwide programme of bus electrification here in Britain would help us justify to the other members of our planet-wide family of nations the urgent need for similar policies for improving both the global and their local environments. It would also "add value" to people's daily lives - something which current British government transport & environmental policies totally fail to do. Trolleybuses, electric buses, air pollution and why so called "cleaner" diseasel§ (aka "less dirty") buses could be worse that buses which give off visible smoke are looked at on the Electric Buses page. §the word "diseasal" is a merging of the words "diesel" and "disease". It accurately describes what heavy duty diesel engine exhuast fumes do to us humans, as well as some of the other living beings who share this planet with us. When photographing the Routemaster destination blinds (seen further up this page) the driver of a different type of bus asked me why I was only interested in the Routemasters. He wanted me to photograph his bus too! So to please him I agreed to do as he asked - and then noticed that the upper (route number & places served) blind on his bus was not correctly wound - and that it would make an excellent example of what is "not so good". This explains the image left - although immediately afterwards I assisted him in ensuring that the blind was readjusted to correctly show the required information. Outside of London (both elsewhere in the UK and overseas) many bus operators are trying to attract passengers to their buses by offering inducements such as free Wi-Fi Internet access, USB power sockets for portable electronic devices and high quality interiors comprising one or more of the following... leather seats, wood effect flooring, under seat floor lighting, glazed skylights [upper deck only on double deck buses], wireless bell pushes, coat hooks, seat back fold-down tables, 'social seating' for groups of four passengers around tables, dimmable saloon lighting, LED downlighters and litter bins. This list is not exhaustive... some bus builders may also offer other luxury features! However, with one exception none of these inducements are being offered to attract more passengers to use London's buses. The exception is that the small fleet of ADL / BYD Enviro200 pure electric single deck buses on routes 153, 507 and 521 have USB charging sockets. There are many possible reasons for this, most likely money is the primary reason. Tables would reduce the passenger capacity of London's buses, which would also be undesirable. 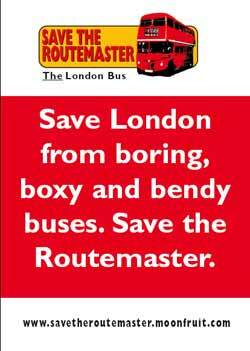 The withdrawal of the Routemaster became an issue in London's May 2008 mayoral election and one of the candidates included in his election manifesto a promise that should he win he would introduce a new Routemaster. This candidate did win the election and duly set about fulfilling his pre-election pledge. It was decided that the design of the new bus should be chosen by means of a competition which would be open to anyone who felt capable of designing a modern omnibus. 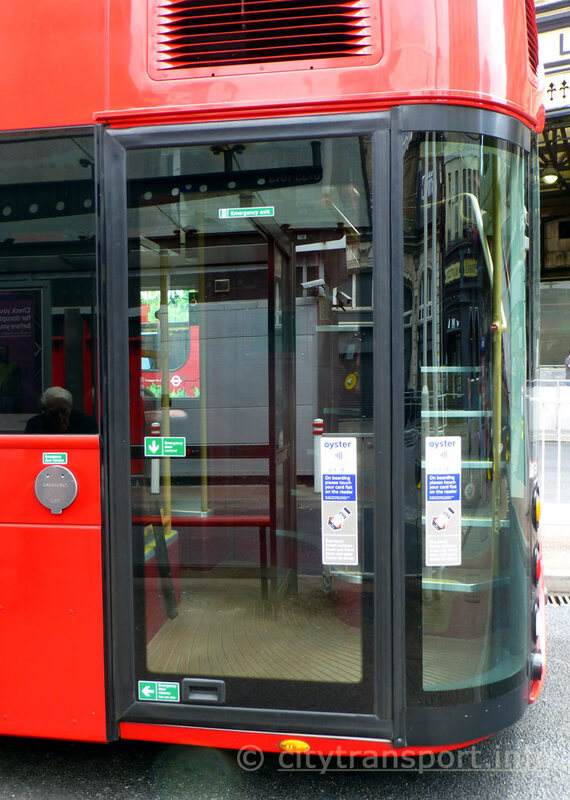 One of the required design features was an open rear doorway which could be used by passengers to board and alight the bus when caught at red traffic signals or in traffic congestion. The competition was held during 2008, with a winner being declared in December. Then bus manufacturers were invited to tender for the contract to build the new bus. 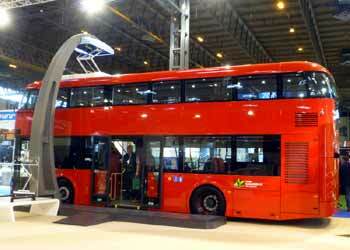 In December 2009 the Northern Ireland bus builder Wrightbus was awarded this contract. In May 2010 the final design of the new vehicle was launched (ie: a design which met the extended design brief and was seen as being feasible to build). Initially a non working wooden mock-up was constructed, with people invited to comment on aspects of the design - such as seating, the space for 'personal wheeled transports', the location of internal hand poles etc., In May 2011 an engineering development vehicle was launched and in the summer this started undergoing the many rigorous pre-production tests designed to ensure that all is well. In November 2011 the Mayor personally drove the first production bus out of the factory and at that time it was expected that the first six of the prototype buses would enter public service in spring 2012, this being just in time for the 2012 Mayoral elections. The purpose of the prototypes was to assess public feedback and decide if any minor changes needed making before large scale production of the new buses commences. For a long time the bus had a code name of New Bus For London (NBFL), with many people expecting that eventually a competition would be held to find a 'street' name for it. However, this did not happen. In many ways an (unofficial) name had already been found, this being the Borismaster (or Boris Bus) in honour of Mr Boris Johnson, the politician and Mayor (of London) who is credited with having instigated its creation. Whether the idea for this bus really does come from Mr Johnson will probably not be known; some reports suggest that its conception was by a Conservative Party right-wing think-tank who saw it as a way to "bash" the transport policies of Socialist Ken Livingstone and to reduce the likelihood of TfL investing time, energy and money in either expanding the Croydon Tramlink system or building any other tramways in the Greater London area. In 2014 the bus was given the somewhat uninspiring official name of New Routemaster (NRM) and although most people use this term for them all on official paperwork it is only used with respect of buses numbered 517 onwards. The first 516 buses are still known as NBFL. 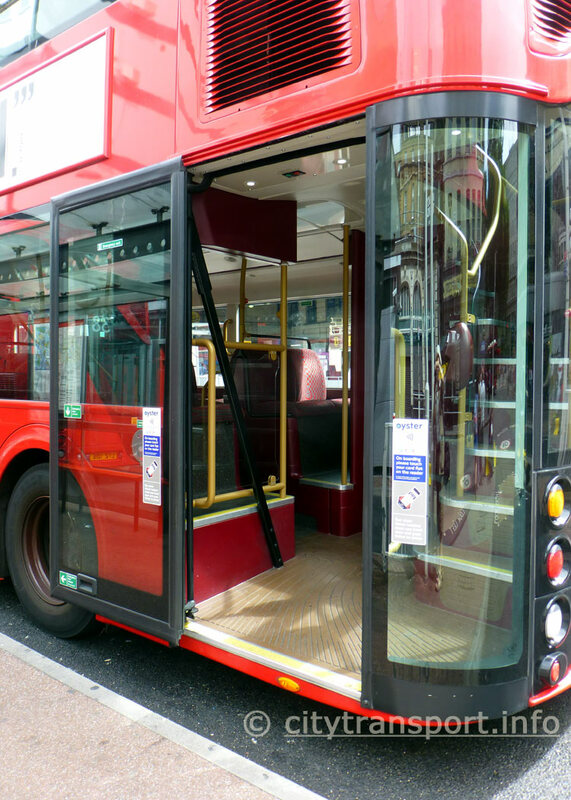 These buses do indeed feature a rear platform opening, however there are also folding doors which can be closed at quiet times when the buses are operating without a bus conductor. 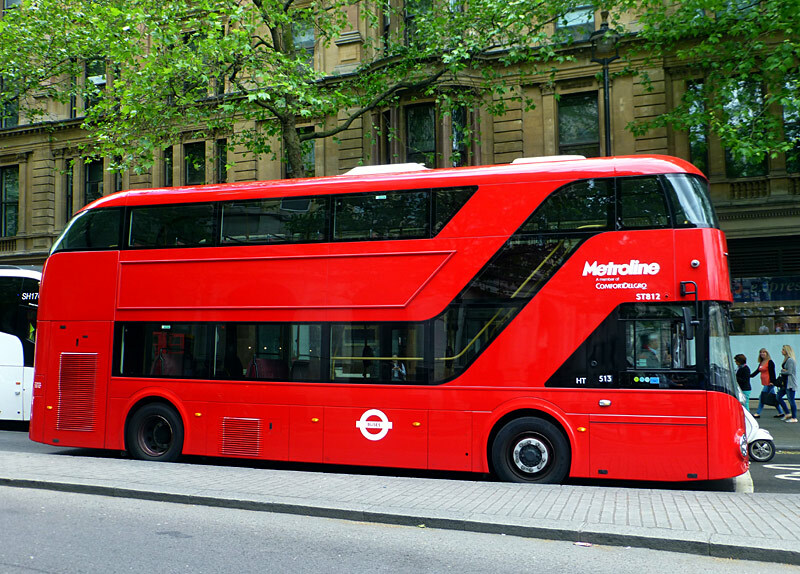 Designed to fit in with London's historic road geometry they are 36ft 9in (11.2 metres) in length, this being about a metre (yard) longer than most of London's other double deck buses and three metres longer than the original RM / Routemaster buses. They are also is 8ft 4in (2.55 m) wide and 14ft 5in (4.4 m) high. Passenger capacity is about 87; with 22 seats, 1 wheelchair space and 25 standing on the lower deck plus 40 seats on the upper deck. In total there are three entrances and two staircases. The lower deck is fully accessible from the front and middle entrances. Wheelchairs and pushchairs (buggies, strollers) should not use the rear entrance as there is not enough space (width) to pass by the transverse seats. As with all modern buses the new buses have a flat front end, rather than the protruding bonneted 'half cab' design of the original Routemaster. The transmission is series type hybrid-electric with a four-cylinder Cummins ASBe diesel engine, Valance batteries and Siemens electric drive with permanent magnet motors similar to that used by Wrightbus on their hybrid StreetCar buses. Although double deck, apparently a single deck variant is also possible and although designed and created for London there is no reason why they could not be sold to / used in other towns and cities as well. Both in Britain and overseas. Perhaps one change to the proposed design which ought to be made relates to the clear glass staircase glazing. The concern is that passing (male) motorists may allow their eyes to wander towards young ladies in mini-skirts, or even micro-skirts, using the stairways. In this respect the designers do seem to have forgotten the lessons of history where some historic designs of London's buses from the inter-war period were built with glazed stairways that subsequently had to be panelled over for the sake of ladies' modesty. Even though modesty seems to be out of fashion nowadays there are many people who still hold this in high regard. Frosted glass would still allow daylight to illuminate the stairway whilst also protecting the modesty of female passengers. One aspect of the NBFL which is attracting some negative criticism is the rear-facing seats. 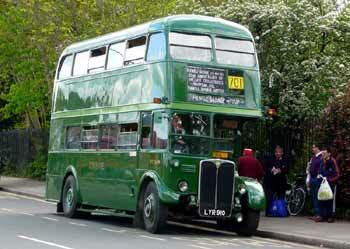 The older Routemaster buses did not have them and many people would wish that the this vehicle did not either. Instead they would prefer the more traditional longitudinal (sideways facing) seats over the wheel arches. 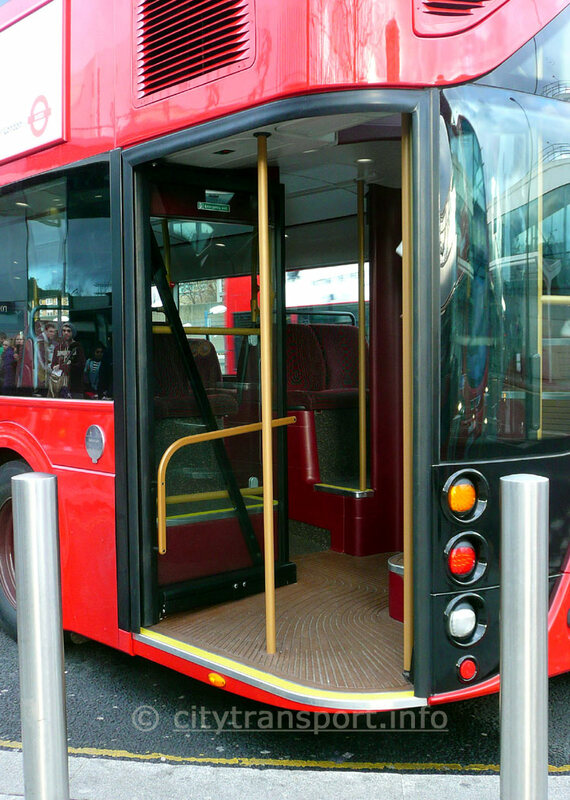 In December 2011 the first of the new buses was put on display with the general public invited to come and see it for themselves. Many people did just that! A short video about this bus which mostly comprises still images (the rear door in action is moving footage) has been placed on the 'youtube' film / video website and can be watched (in a new window) at youtube by clicking either the projector icon or the link below. 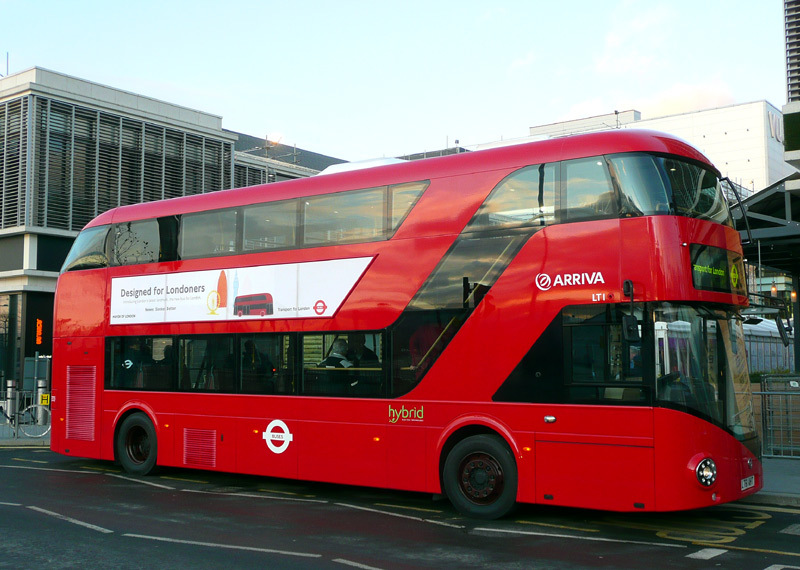 The first New Bus For London (NBFL) as seen before entering service in December 2011. The upper deck from near the front looking towards the back. The lower deck from the rear platform looking towards the front. The first of these buses actually entered service on 27th February 2012. This was as an extra on bus route No.38. Initially there were only a few journeys a day, which only 'sometimes' actually operated. In due course more buses became available and in the end there were eight prototypes in operation on this bus route. As the next film shows, wherever these buses went they attracted much interest, with people using their mobile telephone cameras to take a picture which they could share with friends and loved ones. 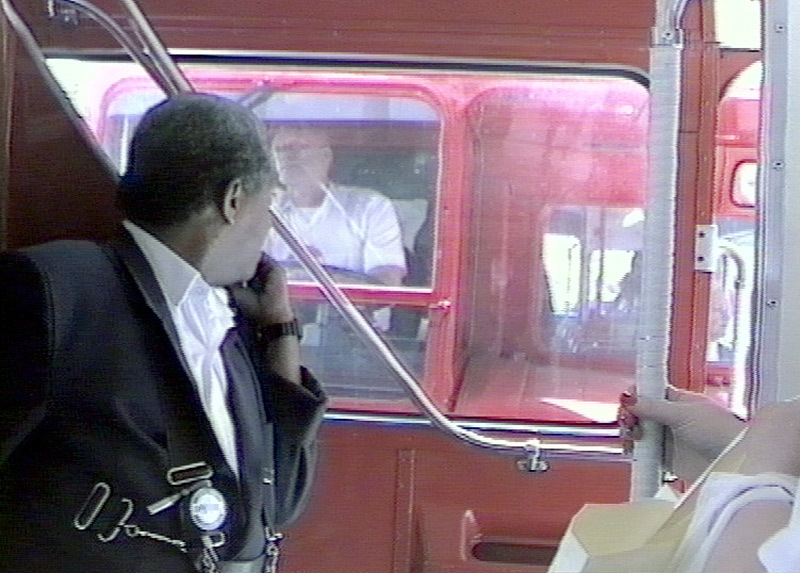 In March 2012 a film showing the prototype buses on route No.38 (including a ride inside one of them) was made and placed on the 'youtube' film / video website and can be watched (in a new window) by clicking either the projector icon or the link below. In September 2012 it was announced that fleet production of these buses would soon commence, with the aim of there being 600 in service by the end of 2016. 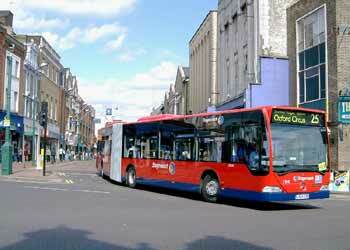 In January 2013 it was announced that the first bus route to be converted to the new buses would be No. 24. This happened on 22nd June. This route needs 27 buses, all of which are brand new vehicles. The prototypes mostly remain on route No. 38, operating in conductor mode for part of the route and for the rest of the time in one-person mode (ie: driver only) with the rear doors closed when not at bus stops. In 2013 some of the prototype buses were diverted from route 38 and used on promotional tours elsewhere in the UK and overseas - including Hong Kong, Singapore, some Gulf states and the USA. In May 2013 it was announced that the second bus route to be converted to the new buses would be No. 11. This conversion started on 21st September and was phased over a few weeks. Since then so many bus routes have started using these vehicles that it is no longer necessary to identify them individually. A short film made in June 2013 showing a few snapshot type scenes of these buses in action on route No. 24 has been placed on the 'youtube' film / video website and can be watched (in a new window) by clicking either the projector icon or the link below. By October 2015 there over 500 of these buses on London's streets. Buses Nos. 1-516 are from batch one whilst buses Nos. 517 upwards are from batch two. Second batch buses are being built slightly differently. The major change which affects passengers is that the curved rear platform door has become a fixed screen which does not open and the flat door slides open along the outside the bus, in a similar way to the middle doors. 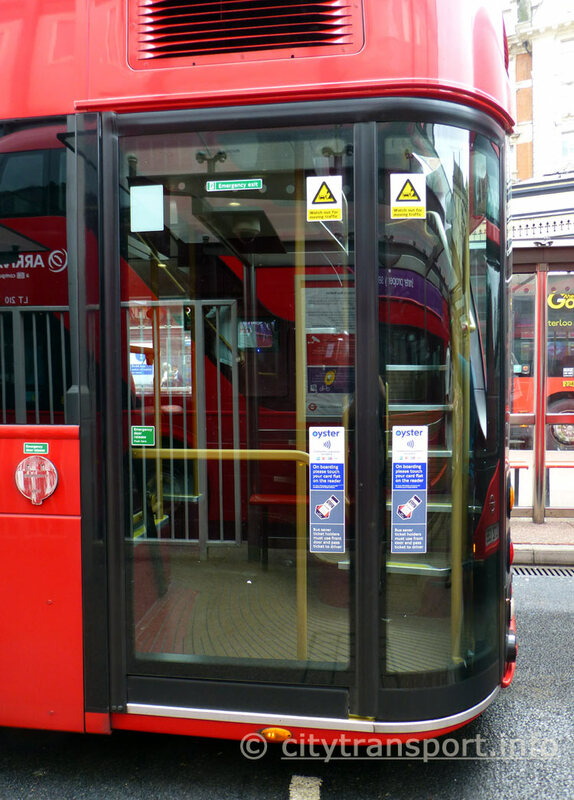 These changes mean that the second batch of buses are not be able to travel with the rear doorway open at all times, this having been one of the original design criteria for these buses. Many people might assume that this change is because the cost of the second member of staff made such operation unviable. Perhaps this is true, however discussion on an internet chat forum which include people who work (or did work) at TfL suggests that right from the outset it was only ever intended that 250 (later reduced to 220) of these buses would actually be used with the rear doorway open and a bus conductor - and only on a twin-shift part-time basis! For the rest of the time, and the rest of the fleet, it was always the plan for the bus driver to open and close the rear door at bus stops - in the same way as the front and middle doors. may prefer that the glass was frosted (opaque). Calling at a bus stop on the Strand, near to Charing Cross Station and a short walk away from Trafalgar Square and Covent Garden. The rear entrance of a first batch NBFL as seen when operating in conductor mode. 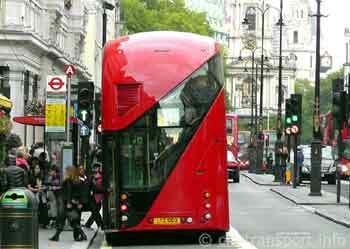 bus has been caught at London's many traffic signals or in heavy traffic. 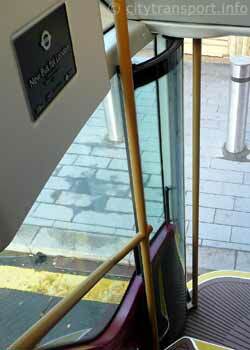 The rear doorway on the first 516 NBFL buses features two doors which open inwards. These are almost entirely glass and when open fold flat (one each side of the doorway) so that their presence is easily missed. The image above - right better shows the curved corner door. The flat door can be seen in other images below. This use of opening doors emulates the outer-suburban coach versions of the former Routemaster (the RMC / RCL) which were used on Green Line and Country Area services. Green Line livery Routemaster Coach RMC 1461 showing its folding doors. This vehicle is also seen elsewhere on this page. 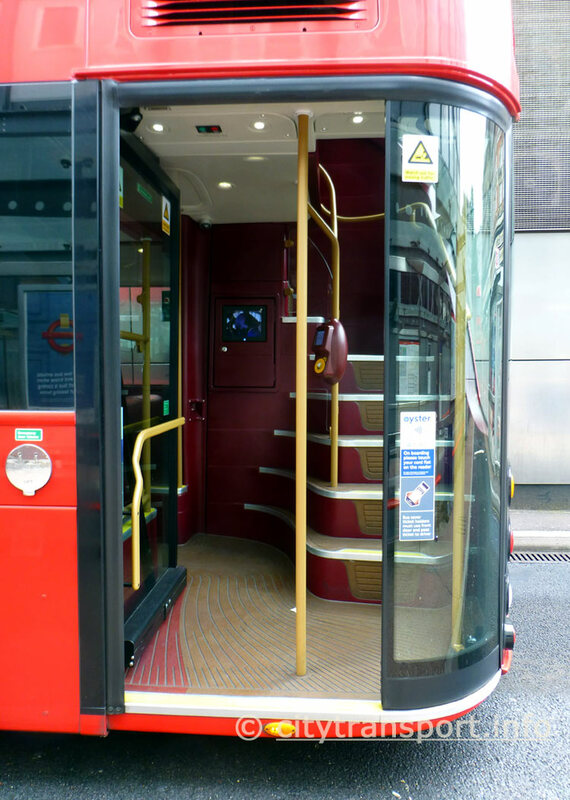 In addition to showing the flat door in open and closed modes, the views below (left & centre) show that the inside of the door which opens has some gold coloured handrails which can be seen when looking in through the glass from outside the bus. Only the first batch buses have these handrails, this makes their presence (or absence) a useful reference point when trying to determine whether a specific bus is actually a NBFL or a NRM. The rear entrance of a first batch NBFL as seen when operating in driver-only mode. 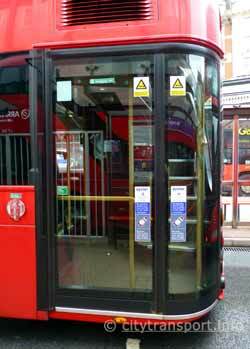 The bus driver opens and closes the flat door whilst the curved corner door remains closed at all times. 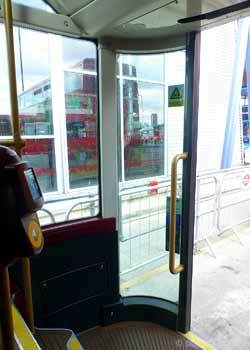 Changing the operation of the rear door resolves an issue that only occurs when the buses are operating in driver-only mode - this being that the path of the inward opening flat door is sometimes blocked by passengers who are waiting to alight - and therefore the door touches them (most frequently their feet - ouch!) whilst it is opening. The rear entrance of a second batch NRM - the curved corner glass is no longer a door - it cannot open. The flat door is opened / closed by the bus driver, this being a process which sees it sliding alongside the outside of the bus. The opening door does not have any handrails on its inside. The October 2015 Update film shows the different types of rear door configuration in action, as well as an example of why the changes had to be made. 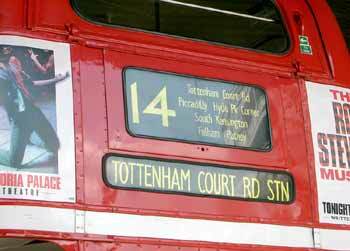 This film also shows these buses at many famous locations throughout London and lists all the bus routes which at the time were using these buses. This film can be watched (in a new window) on the 'youtube' film / video website by clicking either the projector icon or the link below. Too Hot In Summer - No Opening Windows! 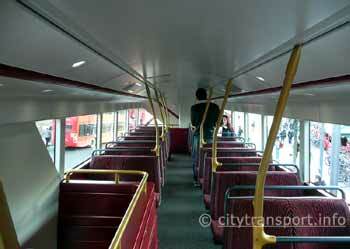 For various reasons, especially aesthetics, these buses were built without opening windows. Weight limitations (for a two axle bus) and the desire to avoid either reducing passenger capacity or adding a third axle means that they do not have full air conditioning. Instead they have an air chill system - which many passengers suggest is ineffective. 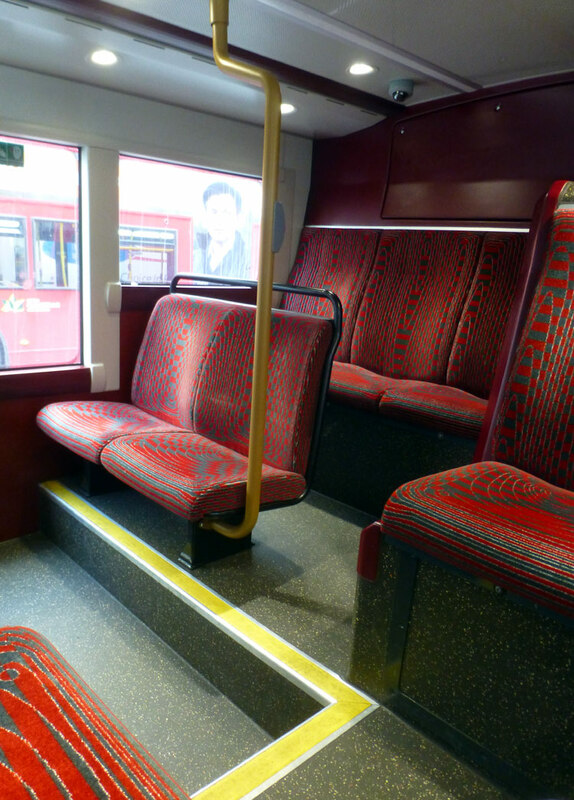 Following many thousands of complaints and the dubbing of this bus design as the Roastmaster, in autumn 2015 it was announced that all new deliveries will feature opening windows and that by summer all existing buses will have been retrofitted with them as well. However, new buses continued to arrive without opening windows and window installation works on existing buses only commenced in April 2016. Since the opening windows topic extends beyond the May 2016 change of Mayor this topic is revisited further down this page. New Shorter Three Door NBFL / NRM Variant! In December 2015 a new variant of these buses was launched. 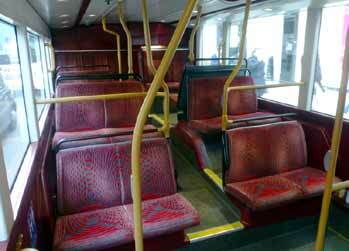 The primary difference is that at 10.6m in length it is shorter and has one row fewer seats. However this bus still has three doorways and two sets of stairs. This NBFL / NRM variant has been allocated the code of ST, the first example was originally expected to be allocated a fleet number of ST2001 but is actually ST812, which implies that whilst the code letters are different the vehicle numbers are included in the same numeric series as their larger siblings. The short NBFL / NRM variant offers 36 seats on the upper deck and 18 seats on the lower deck. In addition it is allowed to carry 31 tightly packed standing passengers. This makes a total of 85 passengers, which is still fewer than some of London's other types of high capacity double-deck bus. The reason for this is that despite being shorter, at 12120kgs the prototype short NBFL / NRM vehicle is still heavier than the lightest full length NBFL / NRM Vehicles. The reason for wanting a short version of this bus is that it will be suitable for routes where the original full-length versions have been found to be too long to fit within existing road configurations without building works (if even possible). Locations such as where it is not possible to make a left turn without removing pedestrian crossing islands or where the bus stands are too short and not easily lengthened using painted road markings. Having passed its safety tests and been certified to carry passengers, in early May 2016 ST812 started carrying fare paying passengers on bus route No.91. and delayed by constantly red traffic signals in Northumberland Avenue / approaching Trafalgar Square (right). A short film showing this bus has been placed on the 'youtube' film / video website and can be watched by clicking either the projector icon or the link below. In January 2016 a small batch of 30 NRM buses were ordered from Wrightbus in N. Ireland. The primary reason for this relatively small order of vehicles which will be delivered after the next mayor has been elected was to ensure that one of the two production lines building these buses at the Wrightbus factory can be kept active. This act of long-term financial planning will reduce the cost of further vehicles - should the next Mayor decide to buy more of these buses. If both production lines had been allowed to close then any subsequent purchases of these buses would have had to include the cost of restarting the production line. At the time it was thought that these 30 buses would have represented the last purchase of these vehicles under the Mayoralty of Mr Johnson. 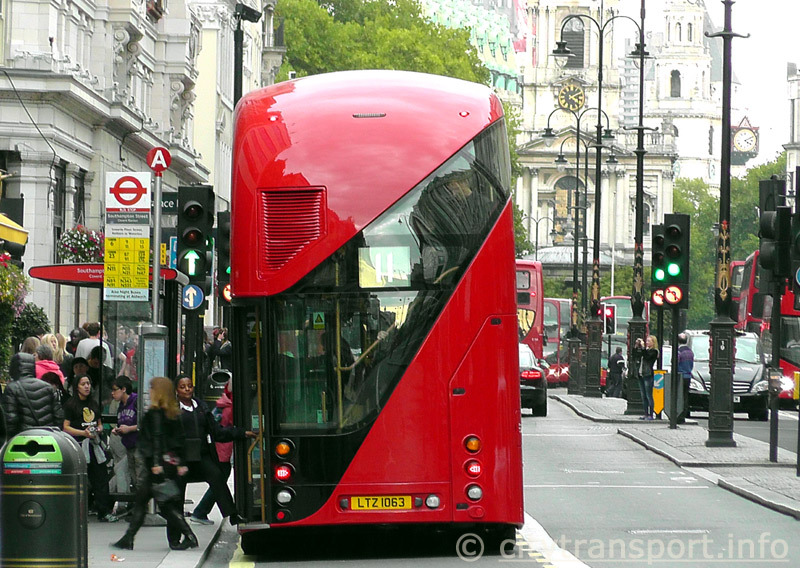 However, in a move that caught many people by surprise, in February the order for 30 additional NRM buses was changed to 195 buses, meaning that when delivered Wrightbus will have supplied 1,000 of these buses - which would fulfill the terms of the contract they won in 2009 and allow the design rights to the bus to pass from Wrightbus to TfL. whether the money should have been spent in the first place. what would the cost have been - had the investment not been made? Money is supposed to make the world go around but it is also a contentious issue about which many people have very different points of view. Many people have been alarmed at the amount of money that has been spent on this project, questioning whether the initial cost of £11.4m for Heatherwick Studios to design the new bus and for Wrightbus to build the first eight vehicles represents value for money and money well spent or profligate largesse - albeit to fulfill a pre-election pledge - which has resulted in much precious finite funds being flushed down a financial black hole. By the time they have all been built, delivered and brought into service the first 835 of these buses for which purchase orders were raised whilst Mr Johnson was Mayor of London are estimated to be going to have a total cost of about £315.6m, with them therefore costing something like £375,000 each - which is approximately £75,000 more than other types of hybrid buses. 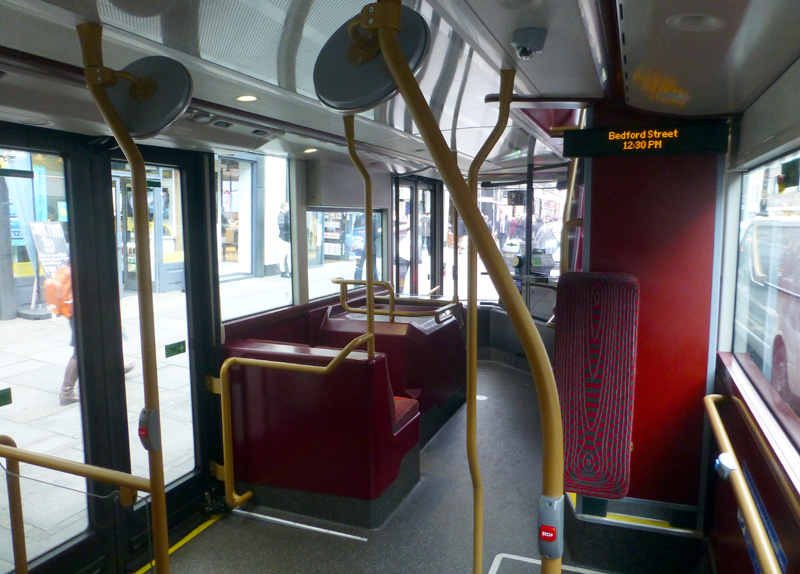 To a large extent their higher cost is because these are high specification vehicles which are slightly longer than London's other buses, with twin staircases, triple doors and an sophisticated air chill system. So it is a case of paying more because the vehicle has features which ordinary twin door / single staircase hybrid buses do not have. Where the vehicle falls down is in its lower passenger capacity, which at least in part is to avoid breaching the legally mandated weight limit for a two axle bus. In addition, the cost of the second member of staff who supervises the open rear door is estimated to be approximately £62,000 a year. This figure assumes tha there are enough second members of staff to cover for two shifts per day, (including some extra people for sickness and holiday cover) plus statutory expenses which are funded by employers rather than taken out of the wages earnt by employees (eg: statutory retirement pension contributions). Most of the text above was written before the February 2016 purchase of an extra 195 buses. When these extra buses were purchased some additional financial information became known which suggests that these buses are not as expensive as had previously been thought. Perhaps part of the issue here is whether the R&D costs of the new buses should be treated as a one-off payment or amortised across the entire fleet. 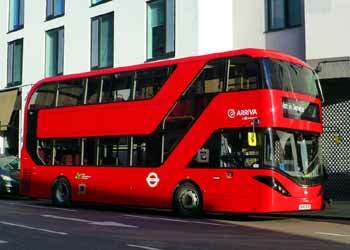 TfL is estimated to have paid about £354,000 per bus for the initial 2012 purchase of 600 New Buses For London. The price paid for the additional 200 New Routemaster buses ordered in 2014 is estimated to have been £325,000. However the cost per bus for the 195 ordered in 2016 is understood to be around £310,000 - £315,000, which is much closer to the price for a normal off-the-peg diesel-electric hybrid bus. Keen eyed readers may have noted a discrepancy in the actual number of buses. Since the initial batch of these buses numbered six so it does seem that the total fleet will eventually number 1001 buses. Something else which has attracted the ire of many people is that unlike most other types of bus, these buses have been bought by TfL and are leased to the bus operators as part of the contract to operate specific bus routes. The stated reason for what is a local government public body buying and owning these buses is because the three door, two staircase design is unknown in the rest of the UK (ie: outside of London) and therefore a less attractive commercial proposition for private bus operators who will eventually need to be able to cascade them for a second life carrying passengers in provincial towns and cities. In autumn 2015 the bus builder Alexander Dennis (ADL) launched what is called a London Look version of its Enviro400 double deck bus. Known as the Enviro400H City this bus features a glazed staircase, air chill system, air suspension and a high-specification London interior. 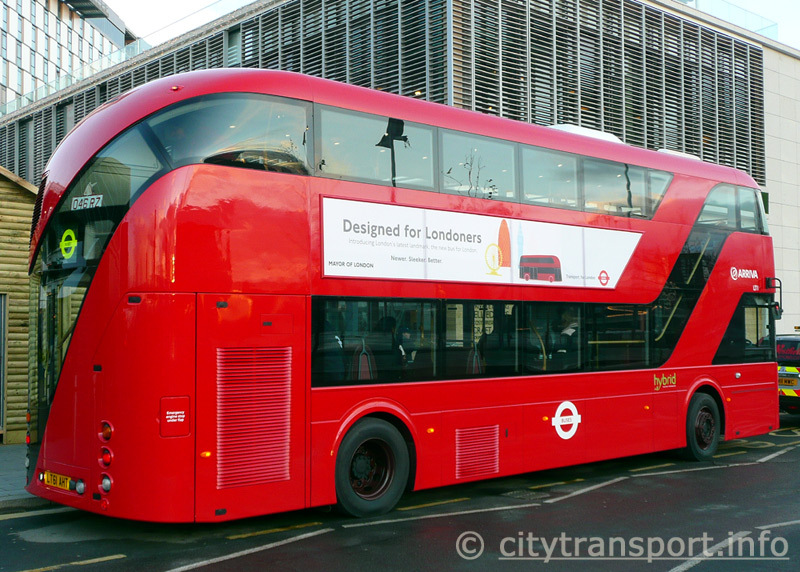 However in many other respects this is a standard twin door bus design which uses the BAE Hybridrive 'series' type of diesel hybrid propulsion system with Lithium-ion batteries and the vehicles are being bought by bus companies - rather than leased from TfL. As of December 2015 there were a few of these buses in service on route No.78 which passes the Tower Of London and crosses Tower Bridge. 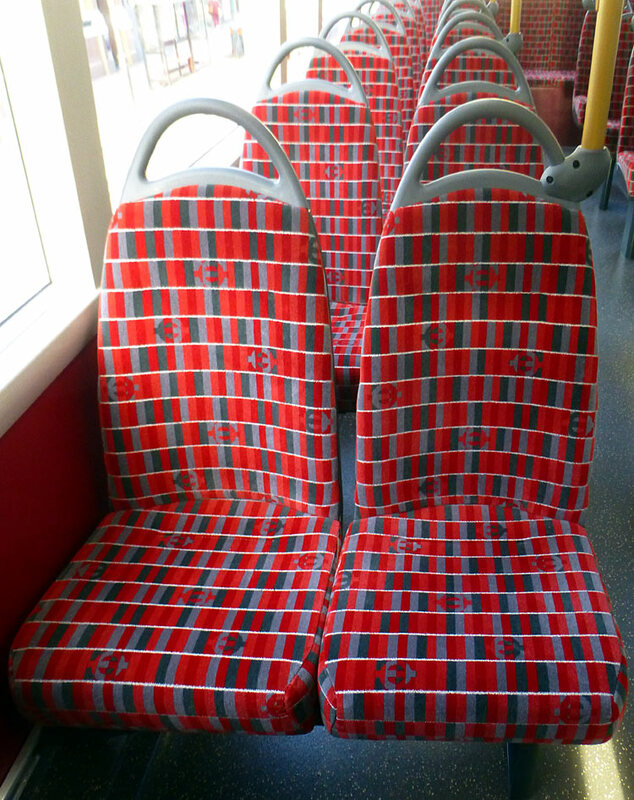 The seat moquette fabric has a specially designed "London" pattern. The specification sheet for this bus details two vehicle sizes, both of which cite twin door buses. In addition the lower deck includes a 'PTW bay' and space for standing passengers. 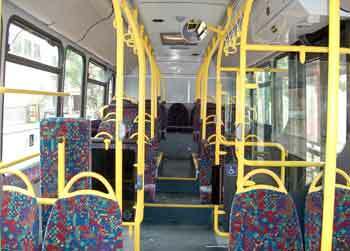 The 10.4 metre version seats 25 passengers downstairs and 41 passengers upstairs. This is the version which is seen in these images. 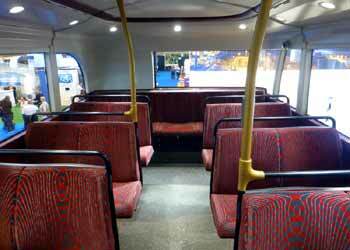 The 11.1 metre version seats 27 passengers downstairs and 45 passengers upstairs. The reason why the longer bus only seats two extra passengers downstairs is that the PTW bay is also longer. PTW = personal wheeled transports as used by 'special needs' passengers eg: wheelchair and pushchair / stroller / buggy. NOT bicycles. Why not take bicycles on buses? As many of the issues related to carrying bicycles on public transport are common to all the transport modes this topic is more fully covered on a popup page which can be reached by clicking this link: Biker.htm. The vehicles destined for London have a TfL specification which does not include many of the luxury features found elsewhere in the UK. Part of the thinking being that buying and operating / maintaining higher specification buses would be more likely to increase costs rather than revenues. At the Shoreditch route terminus bus stand. At a bus stand near the first passenger pick-up point. Inside - downstairs. There are two seats in front of the luggage area (which is over the front left wheel arch) / by the front entrance. Inside - upstairs. The upper deck rear window includes what the bus datasheet describes as a wrapover sky view window - this is a curved glazed upper section. A short film made in December 2015 showing some of these buses in action has been placed on the 'youtube' film / video website and can be watched by clicking either the projector icon or the link below. The film includes crossing the well-known Tower Bridge on one of these buses and looking up at the bridge turrets through the wrapover sky view window. In 2016 bus operator CT Plus introduced 21 Enviro400H-City buses on bus routes 26/N26. More are planned for other bus routes and a full listing can be found below. 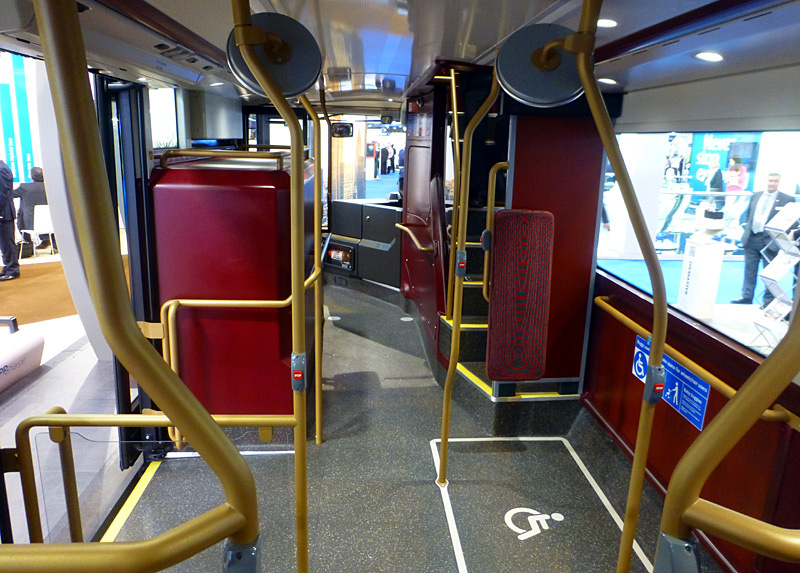 Although initially marketed as a bus for London the Enviro400 City with its distinctive glazed staircase is actually available for any bus operator who wishes to use it. The first provincial conurbation to use these buses was the Lancashire town of Blackpool. 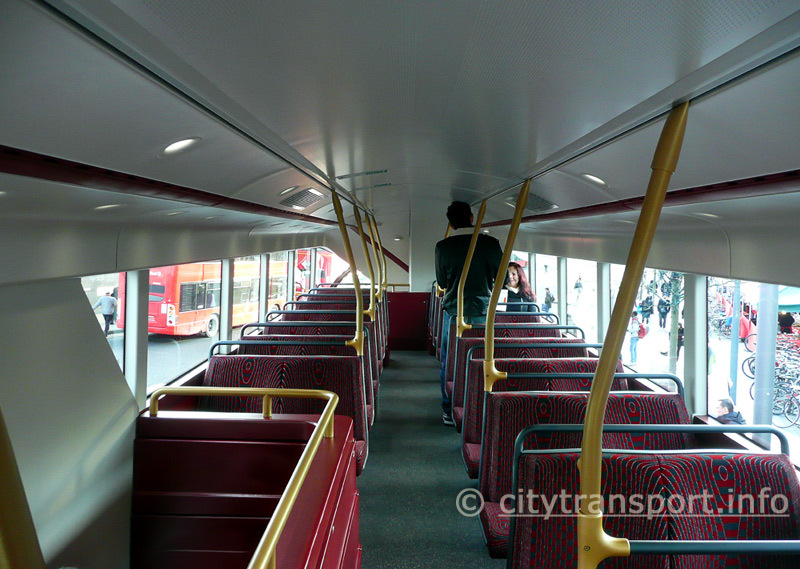 Launched in a media event in July 2016, this fleet of ten 72 seat single door high specification Enviro400 City buses are in a special Palladium branded livery and have an internal decor such as Londoners can only dream about. Features include e-leather seats, wood-effect flooring, USB charging points, free wi-fi and audio / visual 'next stop' information. They have Euro6 diesel mechanical transmissions, so are not hybrids. Blackpool's first batch of these buses were so liked by passengers and bus staff that in November another 25 were ordered for route No.14. A specification upgrade includes what is called social seating on the upper deck. This is where seats are grouped around tables. The idea is that friends and family groups can sit facing each other. The three tables and centrally sited USB charging points also make it easier for pupils from the several schools and university served by route 14 to study during their journeys. Following Blackpool several other British bus operators have also introduced Enviro400 City buses as higher specification upgrades to their services. 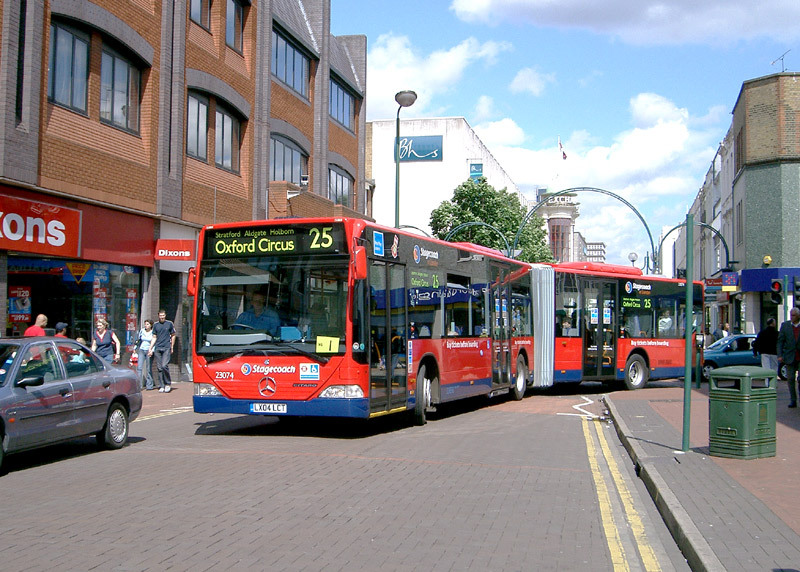 The locations include Reading, Plymouth, Southampton and bus Operator UNO which has some services that also enter London. Mostly these use diesel as a primary fuel source, however the 53 Enviro400CBG City buses destined for use in the City of Nottingham will use the Scania N280UD chassis and compressed biogas (biomethane) as a fuel source. Bristol also has some of the CNG variant Enviro400CBG City buses. In May 2016 Mr Sadiq Khan became the next Mayor of London and within days of his appointment he confirmed that no more triple door twin staircase NBFL / NRM buses will be bought for London. Many people had expected this decision. However existing buses that are on order will still be delivered. These will all be the full length versions - making the shorter length ST812 a unique vehicle. Also announced by the new Mayor was that with 25 of the existing NBFL / NRM buses having been fitted with opening windows the conversion programme was to be speeded up so that 50 buses a week would be modified in this way. This was done by a specialist glass contractor and included a 24 hours wait for the special window glue to cure. There are nine opening windows per bus - three on each side on the top deck plus three on the kerbside (between the middle and rear doors) on the lower deck. Opening windows! These slide sideways, plus there is a retaining latch which is used when the window is closed. In July 2016 it was announced that as part of a policy of reducing operating costs to help make the new Mayor's election manifesto promise of a fares freeze financially viable, the use of customer assistants will be withdrawn after Friday 2nd September 2016. 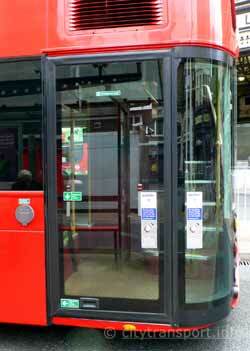 Also known as bus conductors their duties are to oversee the use of the open rear doors on the six bus routes (Nos. 9, 10, 11, 24, 38 and 390) which operated in this way. Hop-on / Hop-off which refers to the ability of passengers to board and alight at locations other than bus stops (eg: traffic signals, when caught in stationary traffic, etc) was one of the primary design features of these vehicles. However bus conductors and hop-on / hop-off still remain on the original Routemaster buses which are used on 15h (heritage) services. 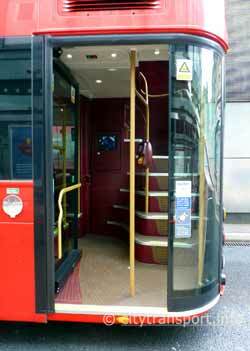 The glazed staircase which first featured on the NBFL seems to have become popular with bus builders and by 2016 was available on many types of double deck buses, including designs aimed at the wider market outside of London. New Shorter Two Door NBFL / NRM Variant! In March 2016 a two door / single staircase version of this bus was launched. This variant of the NBFL / NRM family is 10.6m long and uses the Volvo B5LH chassis which features a Euro 6 parallel type diesel hybrid propulsion system. Originally it was expected that SRM buses would use bus type code of SRM, however they in fact use VHR as a type code. 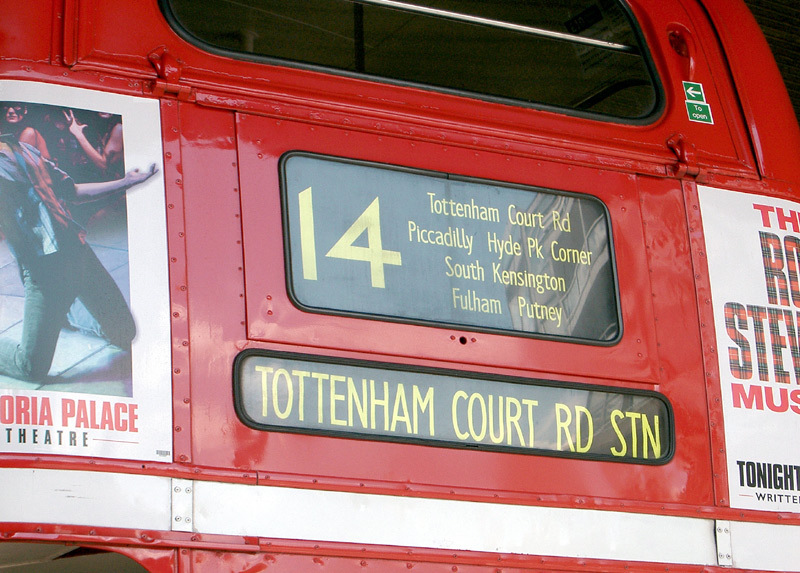 This is perhaps just as well as the SRM code was previously used when 25 of the original Routemaster buses were painted silver for HM The Queen's Silver Jubilee in 1977 and at least one of these historic Routemaster buses is known to still exist - and it still uses the SRM designation. The aims when adapting the original NBFL design to use the Volvo chassis included using as many existing design features and physical parts as possible. Therefore the side structure, roof and floor retain the distinctive NBFL familial design, although the SRM's moulded fibreglass rear dome is a new feature. Unfortunately one design feature of the new SRM which will annoy some passengers is the lack of rear window. Bus garages which also operate NBFL /NRM vehicles will appreciate the high level of commonality of spare parts - only 24 major body parts are unique to the SRM buses. A degree of commonality also applies with buses that also use the Volvo B5LH chassis but have different bodywork styles. The plan was that in late summer 2016 the first six of these SRM buses would be introduced on bus route No.13, to work alongside 50 buses with the same chassis and Gemini 3 bodywork. However, things did not work out as planned and instead by November just the one SRM was in service. Instead it was January 2017 before they had all entered service, mostly on route No.13 but sometimes on other routes operated out of the same bus garage, such as H14 and 183. 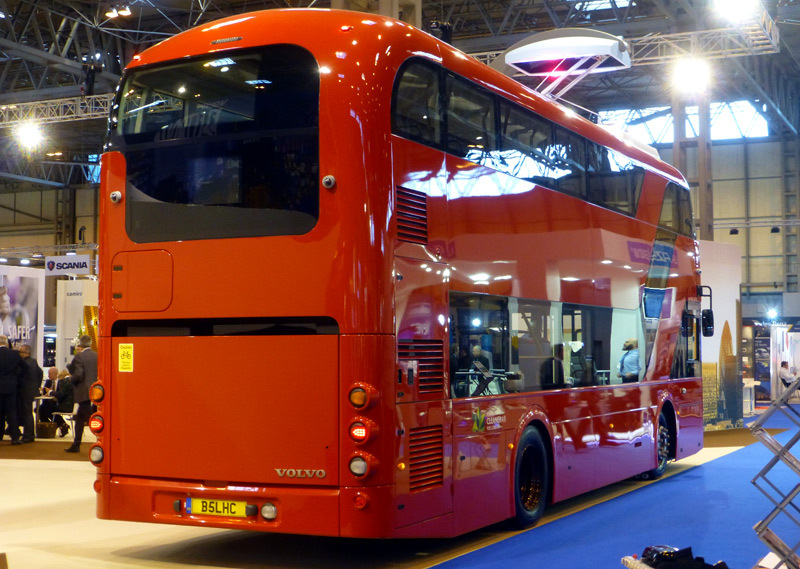 Meanwhile in November 2016 a variant of the SRM bus design was included on the Volvo Buses stand at a bus and coach industry exhibition. It was here to demonstrate what is known as opportunity charging. The concept is that rather than try to carry enough battery power for a full day the batteries benefit from short top-up charges during the day. This is usually done at bus stops, with the electricity being sourced directly from the national grid. There are several opportunity charging technologies, Volvo call the one that they (together with industry partners) created OppCharge. In London the two hybrid OppCharge SRM buses are expected to be able to travel about 4 1/3rd miles (approx 7km) in pure battery mode, after which their onboard diesel engines will start powering the bus. These buses use a modified version of Volvo's B5LH chassis - called B5LHC - which has an increased capacity water cooled Lithium Ion battery pack rated at 19kWh, a more powerful electric motor and equipment for opportunity charging. More information about opportunity charging - including a trial currently underway in London which involves collecting power from our national grid via under-road induction - can be found on Electric Buses page two. 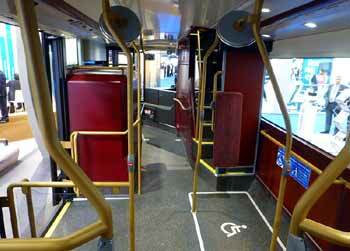 The buses with the B5LH chassis offer 45 seats on the upper deck and 21 seats on the lower deck. 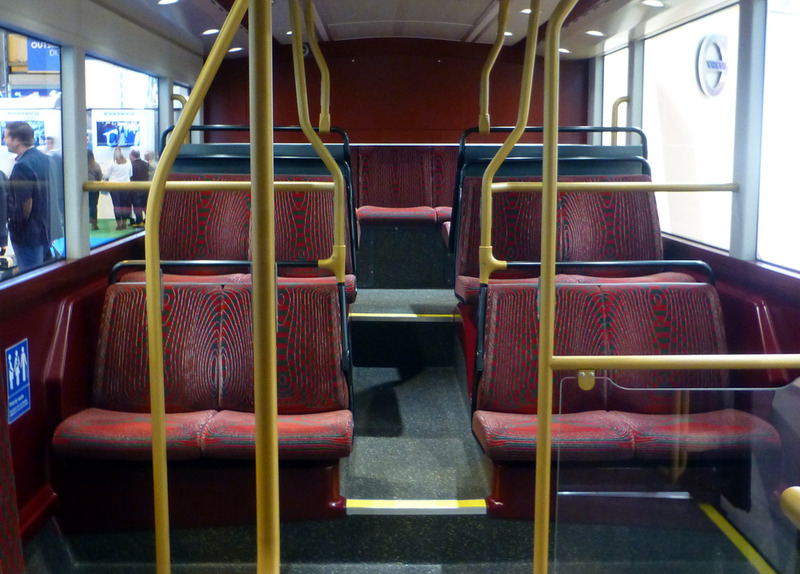 The buses with the B5LHC chassis have a slightly lower seating capacity with 43 seats on the upper deck and 17 seats on the lower deck. Like the rest of the NBFL / NRM family the SRM has an air chill ventilation system (ie: not full air-conditioning). It is expected that they will have opening windows, although the first prototypes are not equipped with them. An OppCharge variant SRM bus at a bus industry exhibition in November 2016. Alas, note the lack of rear window on the lower deck! An SRM laying over between journeys in the Aldwych area of London. 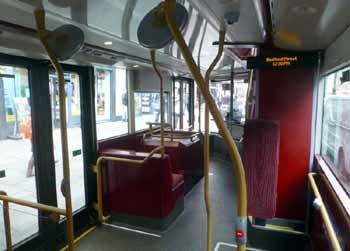 Inside an SRM bus showing the rear of the upper deck. Above - left: Looking forwards on the version with the B5LH chassis showing the luggage area and two seats between the front and middle doorways. Above - right: Looking forwards on the version with the OppCharge B5LHC chassis showing the battery pack between the two passenger doors. There is some luggage space above the batteries. More lower deck views on the version with the B5LH chassis - it needed several photographs to show the very different arrangement of the seats. Here there are four rows of seats on the kerbside and five rows of seats on the driver's side. In both cases the first two rows are symmetrical and face forwards. The third row of seats faces the back and is set at a higher level higher on the kerbside. The fourth row of seats face forwards and (again) is higher on the kerbside. Finally there are three additional forward facing seats on the drivers side of the bus and at the end of the passageway. The centre image was taken whilst seated on a kerbside seat in row three and the image on the right was taken from the middle seat at the very back of the bus. Critics of the cost of the NBFL / NRM bus project will be pleased to hear that these new buses will be bought by the bus operators - rather than TfL. The reason for this is that their much more conventional single staircase / twin door body format and well known / well proven vehicle chassis makes them easier to cascade to bus routes outside of London, which is what usually happens partway through the commercial life of London's buses. 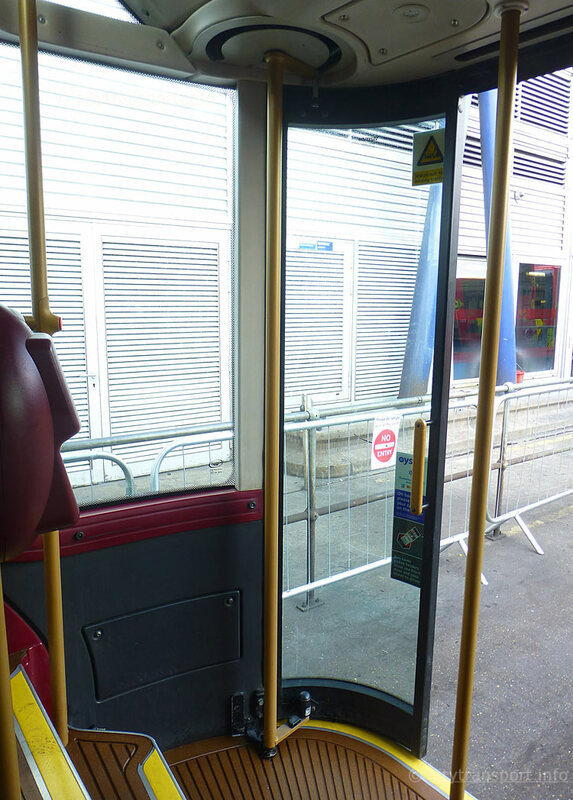 Because many bus operators outside of London prefer single doorway buses a retrofit kit will be available to replace the middle doorway with a solid wall. A variant of the SRM which has just a single doorway is also planned. This will be aimed at provincial bus companies which would like to buy brand new SRM buses with just the one doorway. Other options for provincial bus companies include a longer 11.3m version and pure diesel (ie: not hybrid) power trains. The latter will be of interest for interurban services where buses need to travel at speeds higher than usually found on the streets of London. Although the first six SRM buses destined for London use the same seats as the rest of the NBFL / NRM fleet, it remains to be seen whether bus operators outside of London will be able to use the same seats. 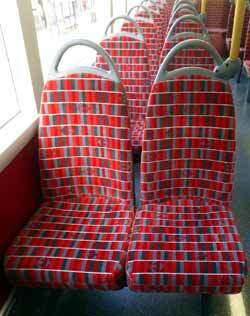 This depends on who owns the intellectual copyright for the seats and fabric design. In any case they will always be free to select different seat styles and their own choice of seat cover fabrics. 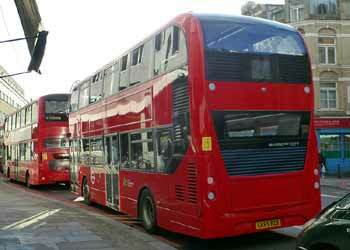 By summer 2017 it became obvious that whilst London was still buying new buses none of these included the SRM variant. However at least some (if not all) of the SRM buses which have already been delivered are in passenger service in North London. In August 2017 Volvo allowed one of its two OppCharge SRM buses to carry passengers for the first time. This was during a leisure-themed bus event aimed at the public. This event was held in Warwickshire - which is nowhere near to London! The other OppCharge SRM bus is understood to be being used by Volvo for technology research and development. The last of the New Routemaster buses (No.LT1000) quietly entered service on 18th February 2018. There was no fanfare or any other special event to mark this. It is used on bus route No.267. This seems to mark the end of the New Bus For London / New Routemaster construction and roll-out phase, as no other town or city has purchased any of them - nor any of the SRM variants. Not even Leeds, where bus operator First Group borrowed one of the NRM buses to use as part of a marketing campaign to show how bus travel in Leeds could be improved. It is now thought likely that the real aim in Leeds was solely to stifle the implementation of a Bus Rapid Transit service (using zero emission trolleybuses) which they might not have won the contract to operate and therefore would have acted as a commercial rival to the services which they offer to the travelling public. Even though no more are being built, the NBFL / NRM buses which are currently in service in London will continue in service for as long as their commercial life permits. For this reason they will benefit from half - life refurbishment and upgrades, as required to keep them available for front line services in Central London. One already planned upgrade will see the oldest of these buses being modified to meet the latest air pollution standards. To recap, these standards became more stringent after several hundred NBFL buses had already entered passenger service. 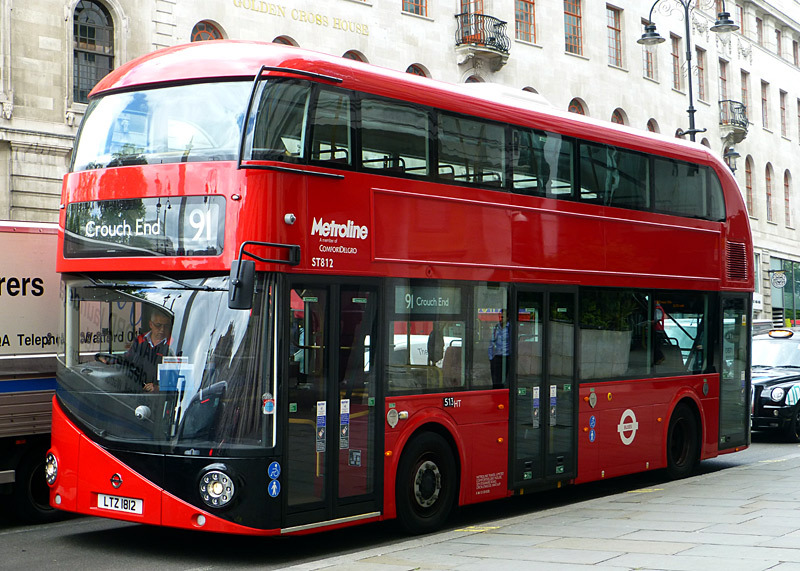 In London the selection of which brand of bus is to be used is a commercial decision made by the company which wins a contract to operate a bus service that requires new vehicles. Transport for London (TfL) may specify a vehicle type (eg: single / double deck, whether hybrid, pure electric, etc.,) and passenger capacity but - apart from the bus routes which use the NBFL / NRM buses, which they supply themselves - TfL do not normally specify anything more. Certainly not which bus builder should supply the new buses and which bodywork style from their current product catalogue should be chosen. 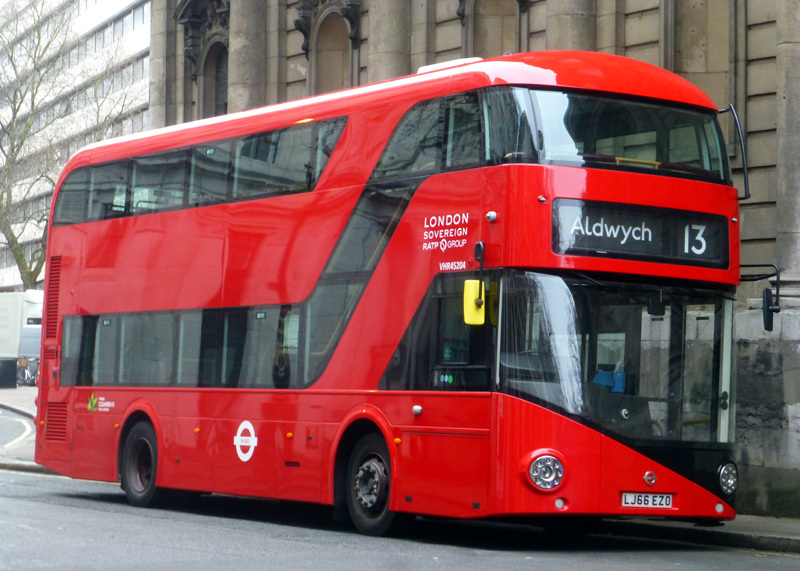 This explains how it is possible that despite the Wrightbus SRM buses using a standard Volvo bus chassis which is still being supplied on some of London's most recent new buses, bus operators have chosen alternative bus bodies - such as the Wrightbus Gemini. In some cases the bus operators have bought their new buses from a different supplier who uses the same Volvo bus chassis but bus bodies which have been sourced from Egypt! The lookalike rival to the New Routemaster (the Alexander Dennis Enviro400H City) has been more sucessful in London, having been selected for several bus routes. But again, in many cases the bus operators have chosen to buy buses from ADL which has the standard design of Enviro400 bodywork. Information compiled at the time of this March 2018 page update. NBFL/NRM buses are used on daytime bus routes Nos. 3, 8, 9, 10, 11, 12, 15, 16, 21, 24, 38, 48, 55, 59, 68, 73, 76, 88, 91, 137, 148, 149, 159, 168, 189, 211, 253, 254, 267, 390, 453 plus East London Transit routes EL1, EL2, EL3. They are also used on night bus routes Nos. N3, N8, 10, N11, 12, N16, 24, N38, N55, 76, 88, 148, 149, 159, 189, 390, 453 and EL1. SRM buses are generally used on route No. 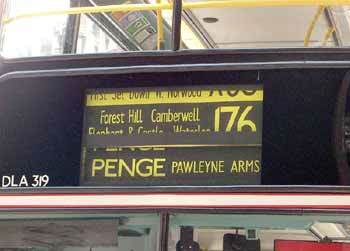 183, although they have been seen on a some of the other bus routes which are operated from the same bus garage. It is understood that at some stage (date unknown) one or both of the SRM buses which have been fitted by Volvo with power collectors for the OppCharge overhead pantograph gantry Opportunity Charging system will be trialed in London. 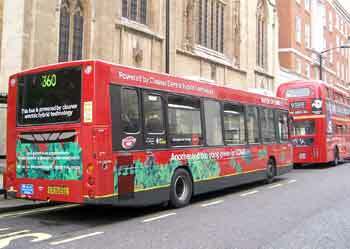 London's Enviro400H City buses are used on daytime bus routes Nos. 26, 78, 133, 333 and 388. They are also used on night bus routes Nos. N26 and N133. In September 2018 they will also be deployed on night bus routes Nos. N550 and N551. Currently London has 91 of these buses. 'Side-Step Congestion' / Bus priority systems. This page last updated 10th March 2018. © Copyright 2001-2018 Simon P Smiler and named image sources.